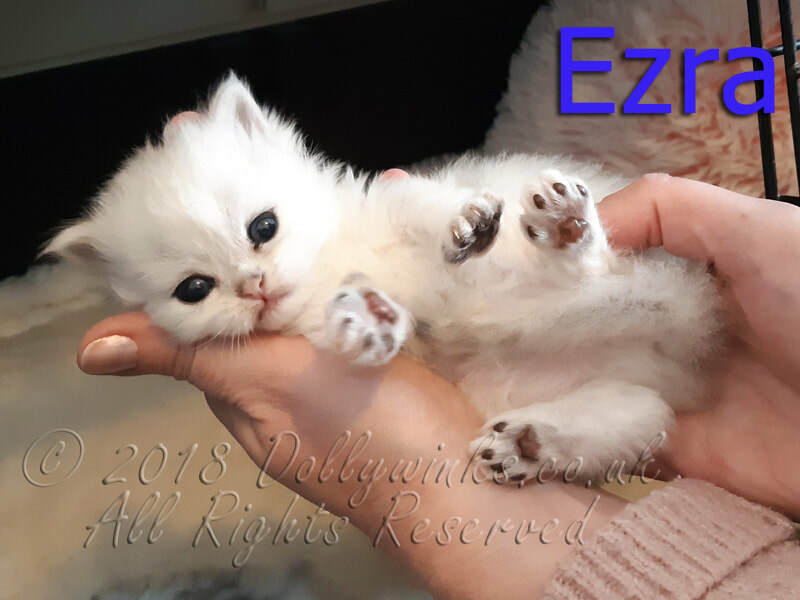 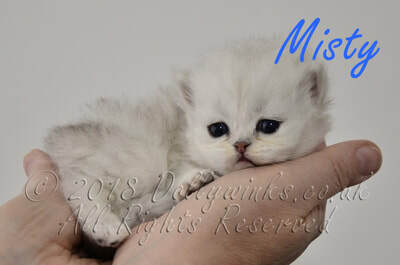 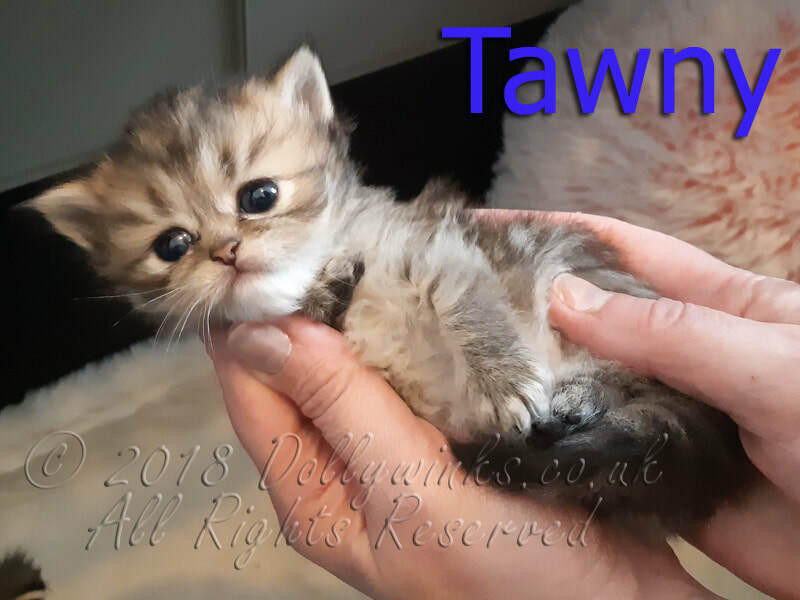 We have a limited number of Chinchilla and Persian kittens available (for sale) through out the year and will appear below when ready for choosing. 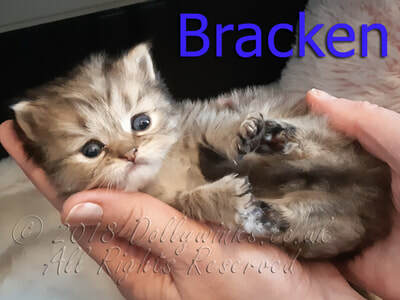 Our list of planned matings/ litters can be found here. All our kittens are sold subject to our kitten agreement. If you don't agree with our terms please do not waste the kittens time. A copy can be downloaded here. 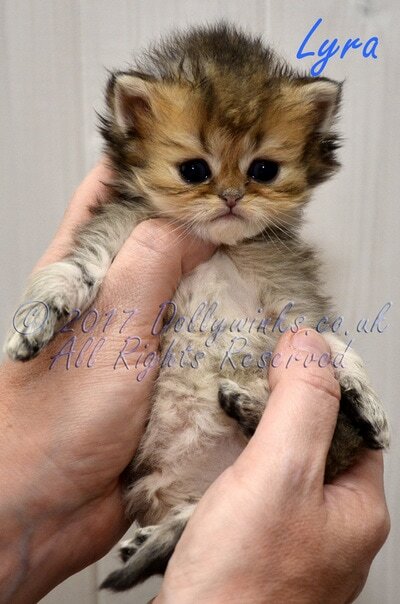 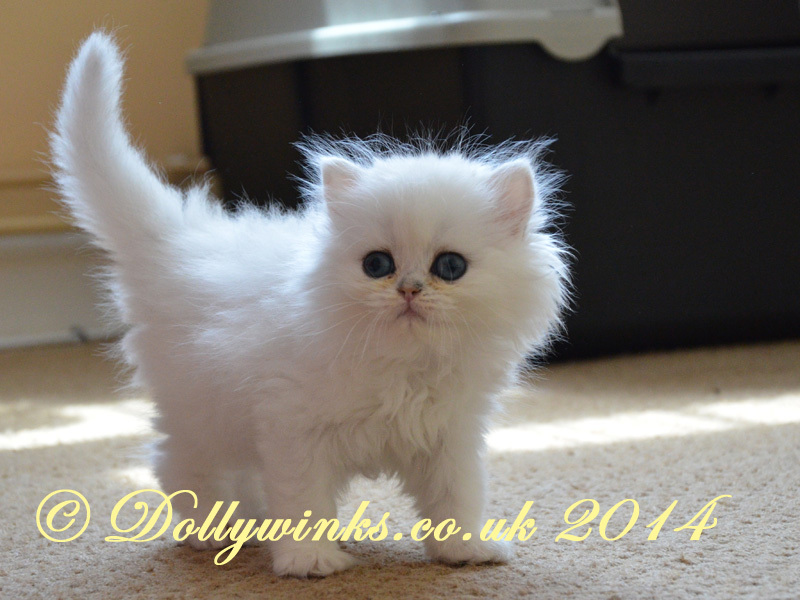 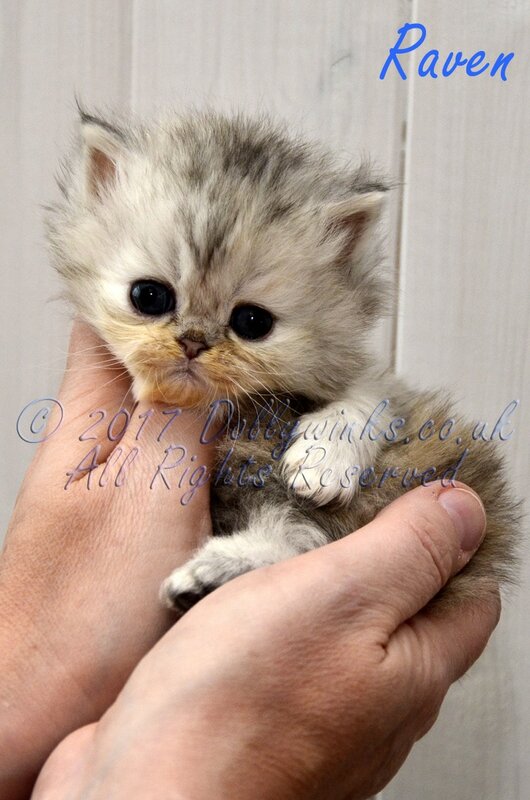 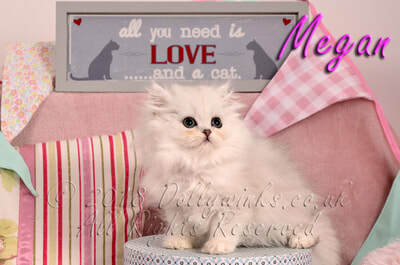 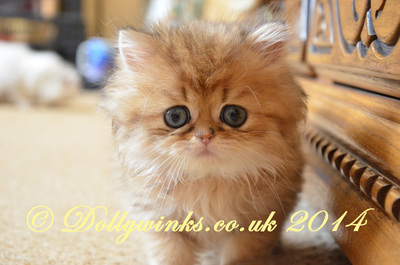 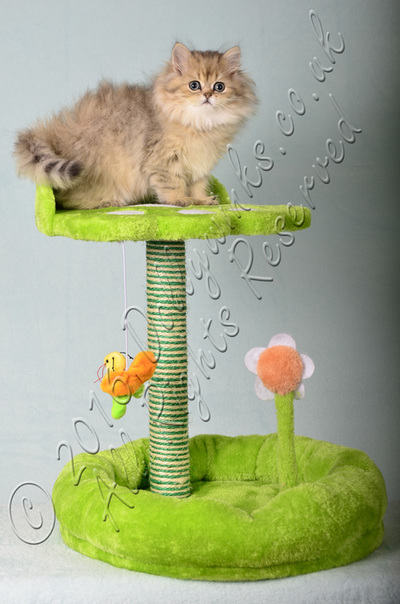 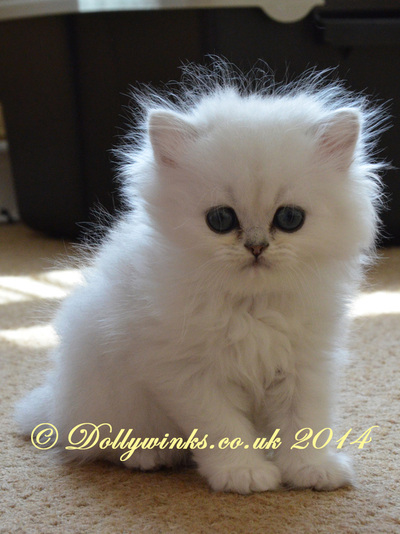 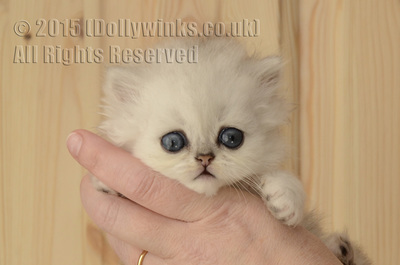 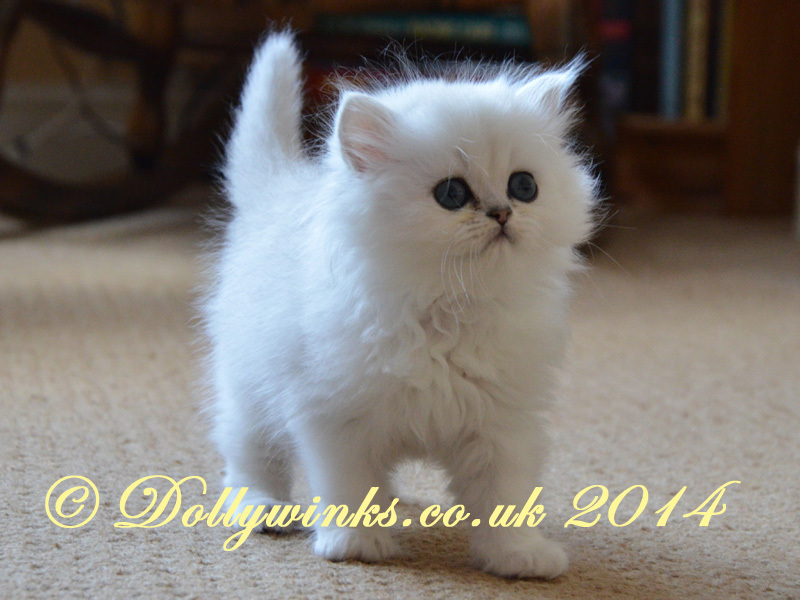 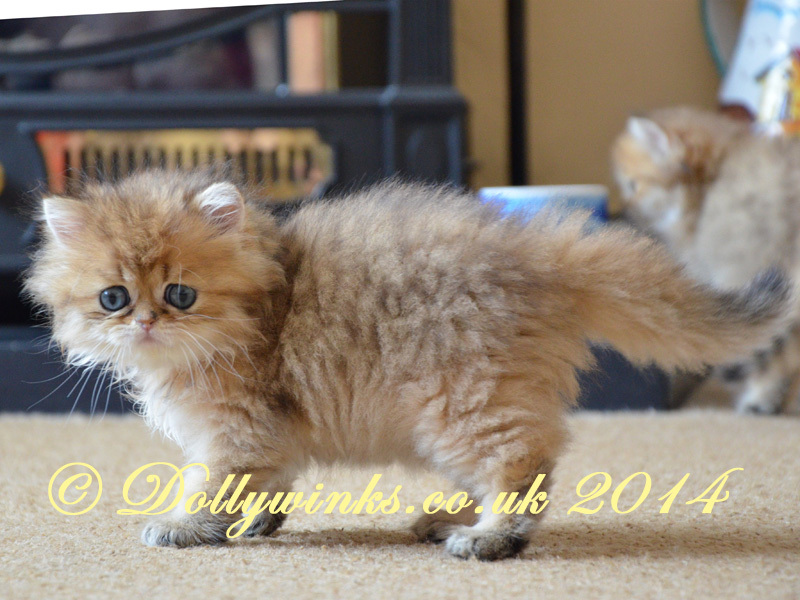 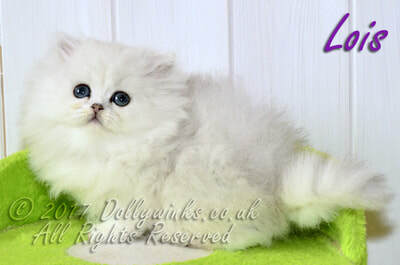 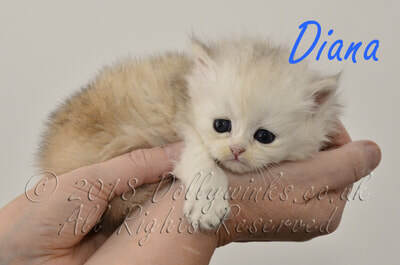 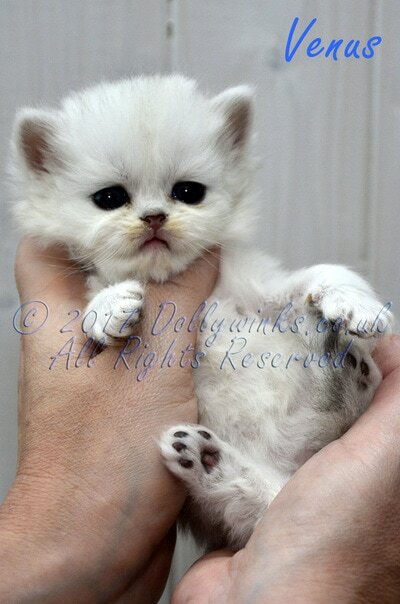 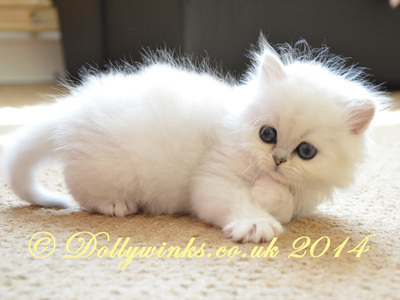 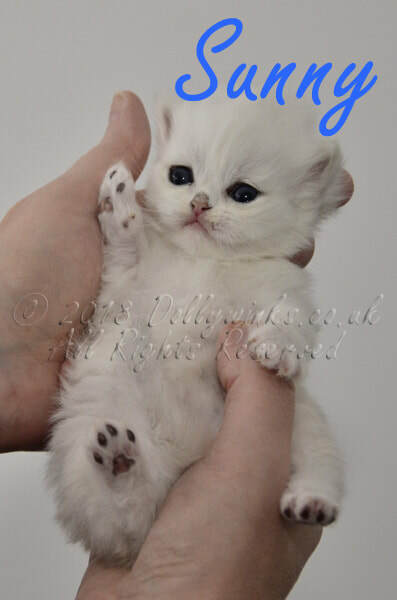 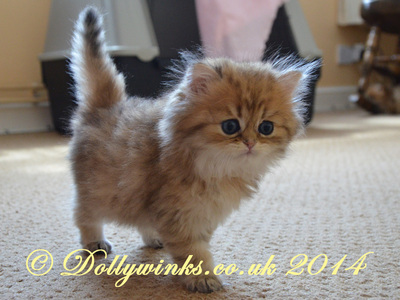 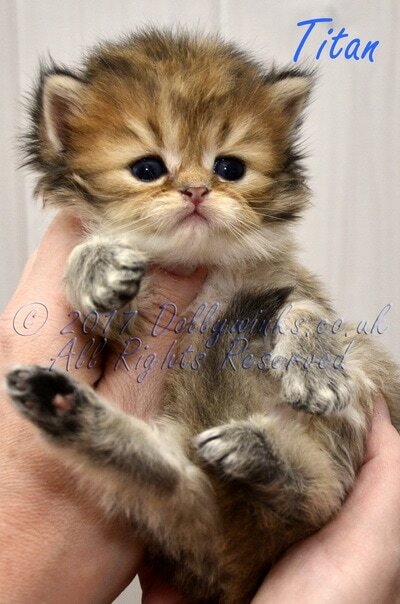 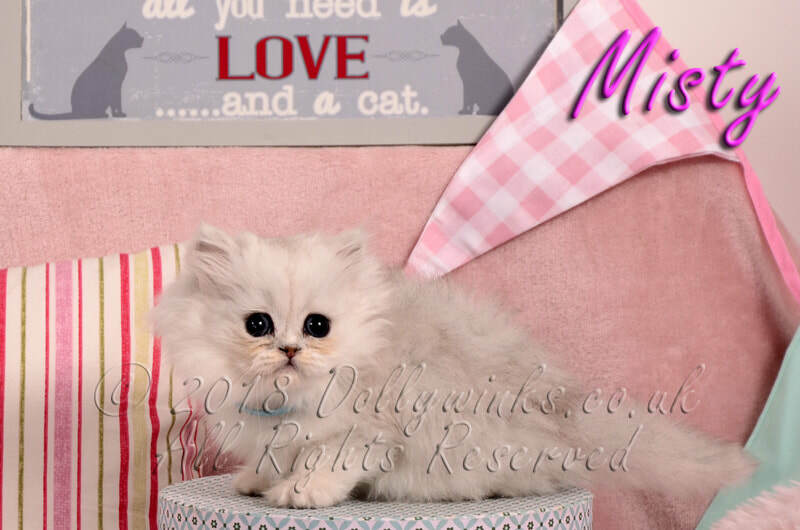 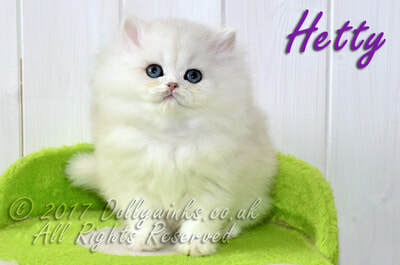 Our 2019 prices for Dollywinks Chinchilla kittens and Persian kittens are £750 and are non negotiable. 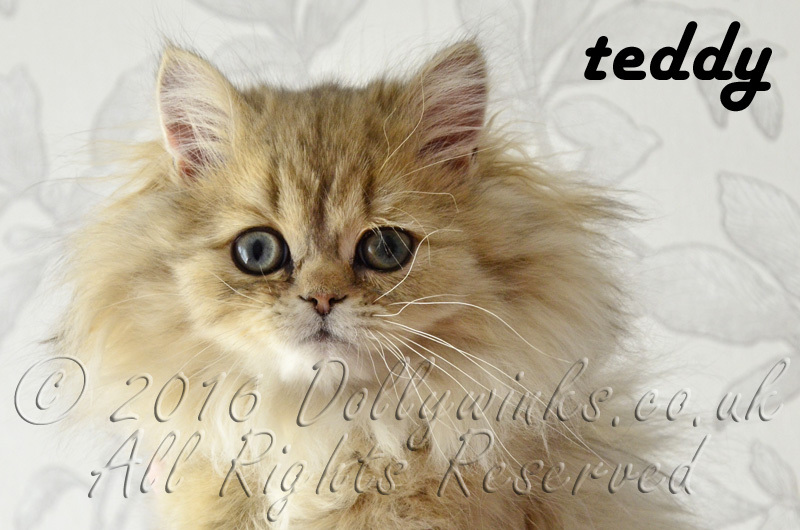 Your chinchilla or persian kitten will be registered with TICA. 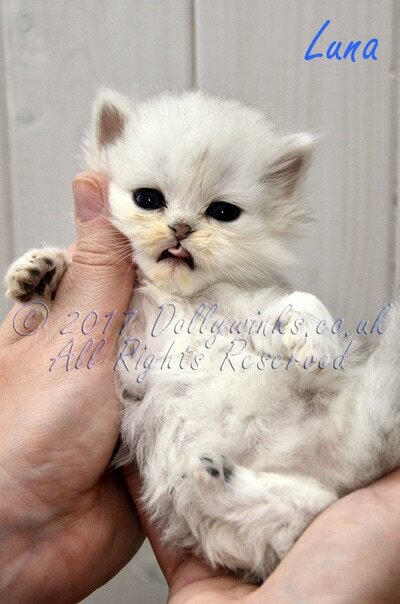 The kitten will be early neutered and be fully vacinated and wormed. 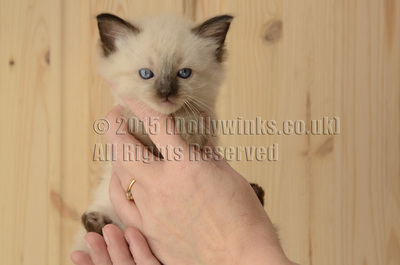 You kitten also comes with a 5 generation pedigree, and more importantly fully socialised into family life. You will also receive 4 weeks free pet insurance as well as a kitten pack containing food, toys, and litter. 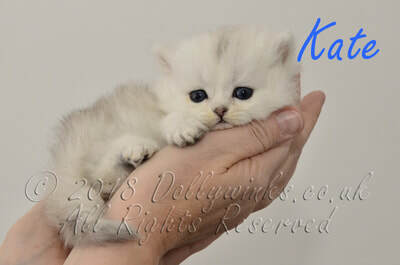 You will be required to sign a kitten agreement that ensures the future welfare of your kitten that also helps to promote responsible ownership. The contract is binding and is there to protect the welfare of the kitten and the reputation of Dollywinks. 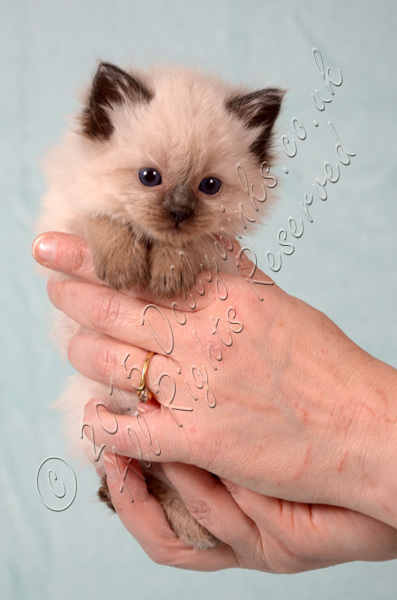 All our kittens are sold subject to our kitten agreement/ contract. 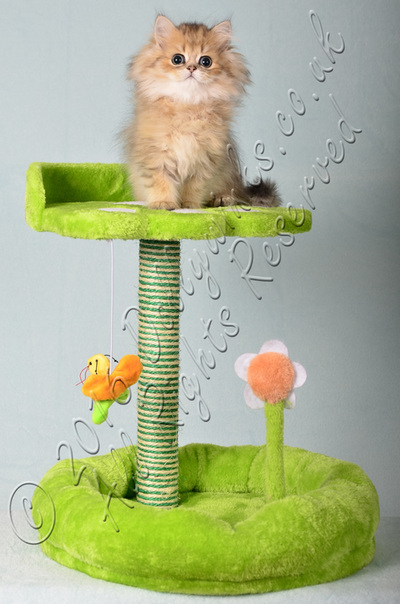 If you don't agree with our terms please do not waste the kittens time. 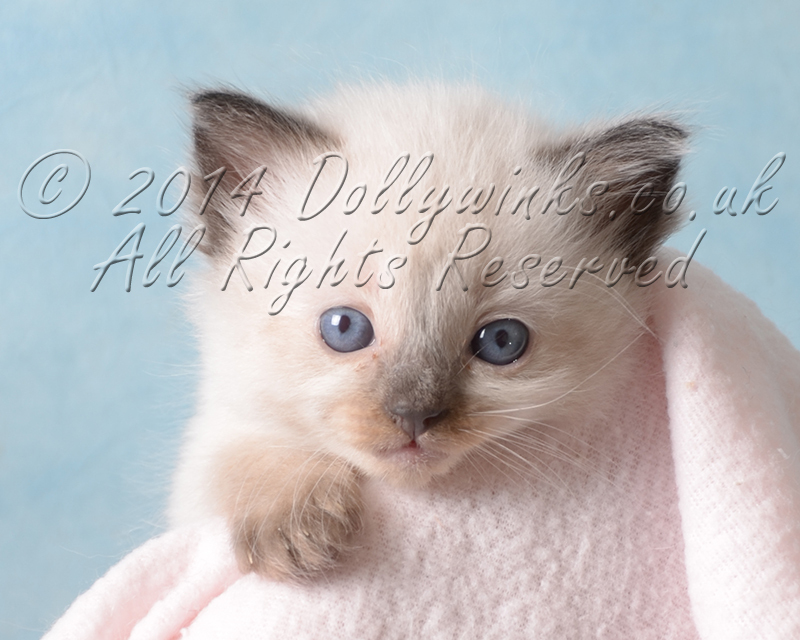 A copy can be downloaded here. 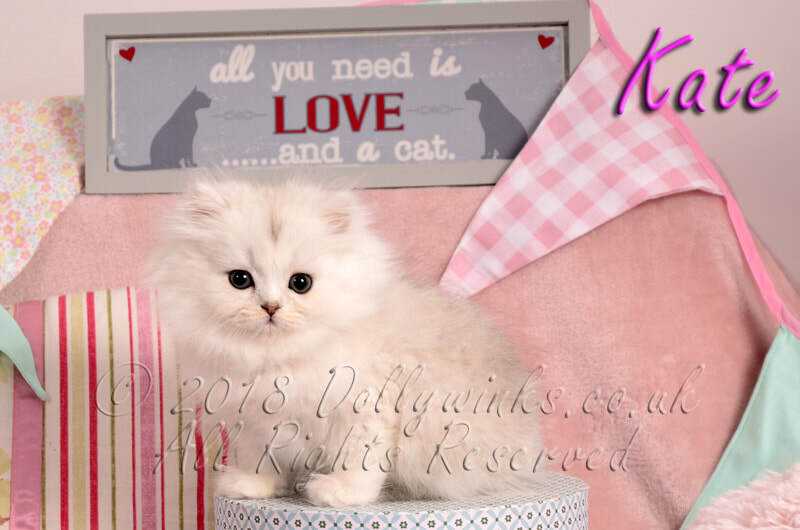 When you collect your new Chinchilla or Persian kitten from us we will provide you with a diet sheet, detailing the foods that it has been weaned on. It is advisable to continue feeding your Chinchilla kitten this diet for a minimum of 2 weeks. This is to avoid your Chinchilla developing any tummy upset and remember that it is very stressful for your new kitten when it joins its new family. 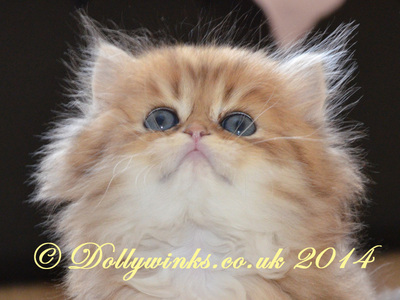 If you decide to change its diet do it gradually to avoid your Chinchilla or Persian developing diarrhoea. 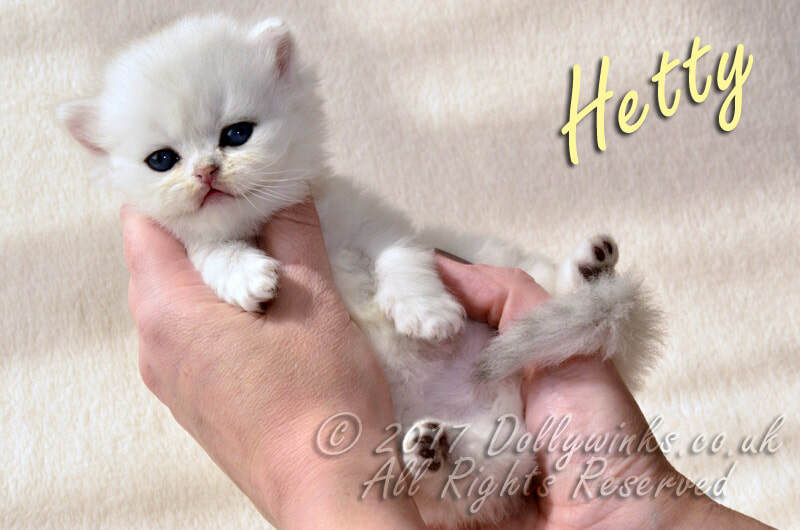 We are proud to announce a litter of Chinchilla kittens from Molly and Oscar. 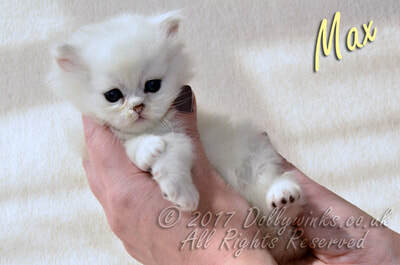 This will be Mollys last litter. 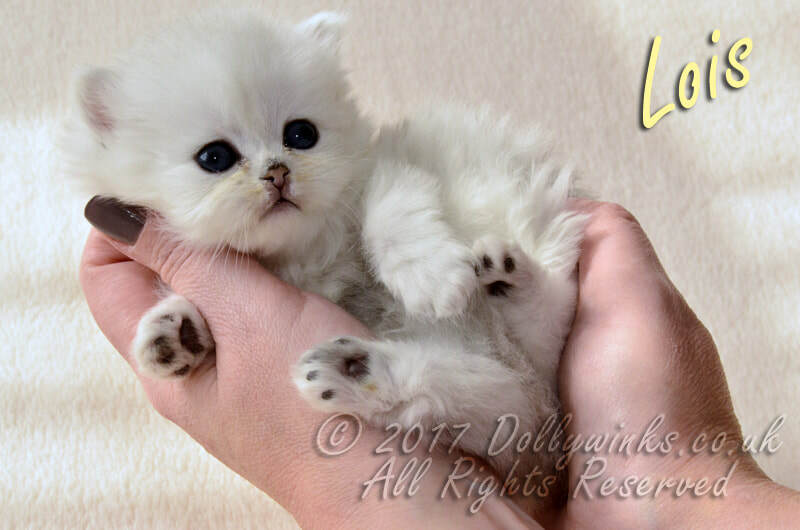 The name of this litter is "The Winter Warmers"
We are proud to announce a litter of Chinchilla kittens from Honey and Caspar. 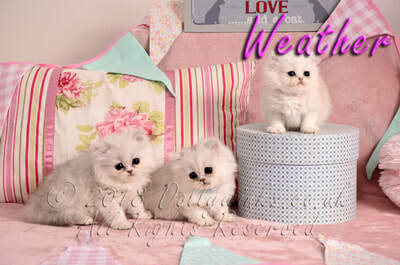 The name of this litter is "The Weather"
We are proud to announce a litter of Doll faced Persians from Eden and Caspar. 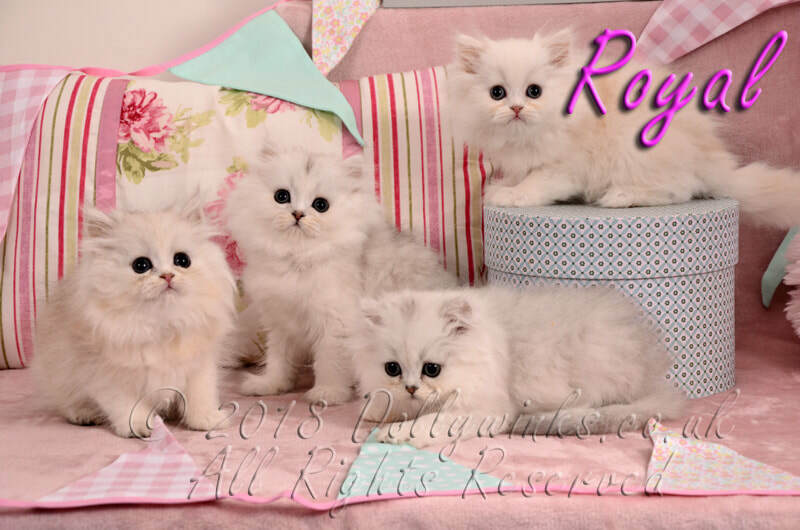 The name of this litter is "The Royals"
These were taken in the evening so colours reflect this. 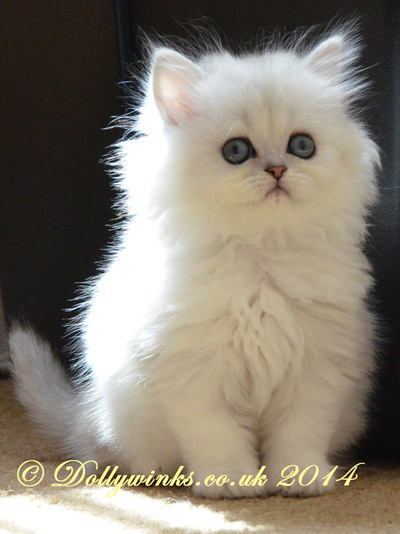 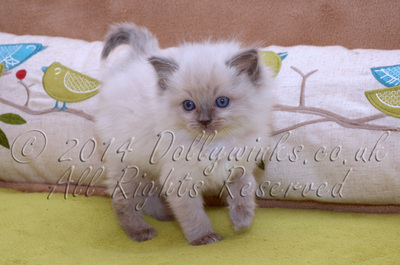 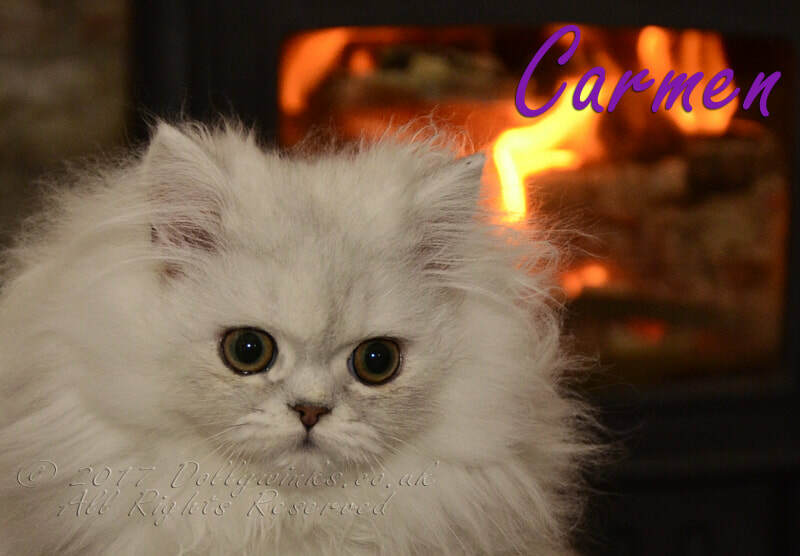 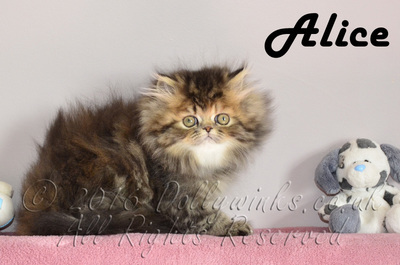 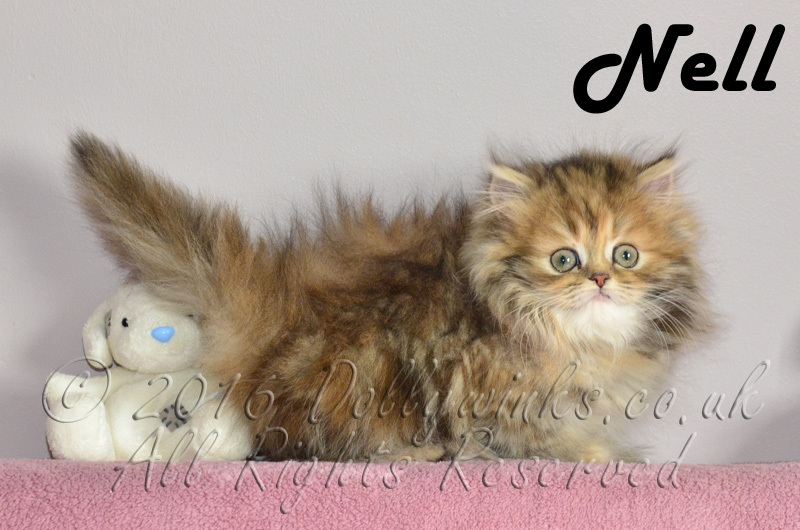 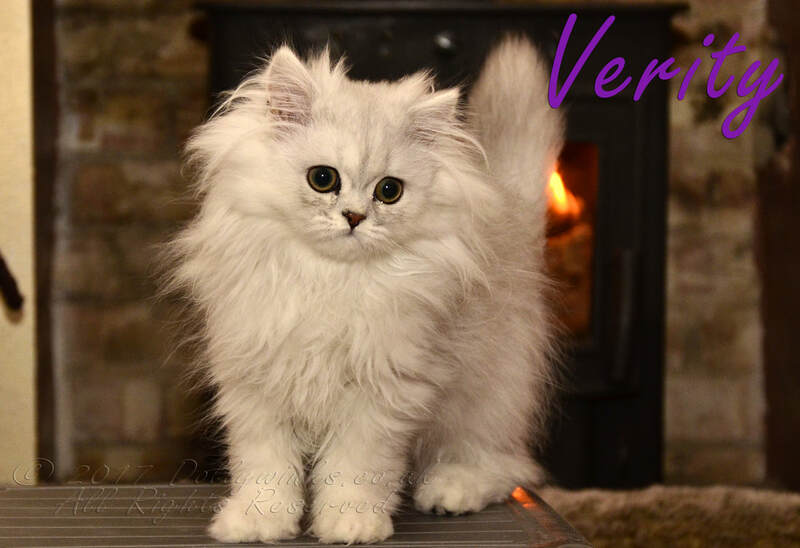 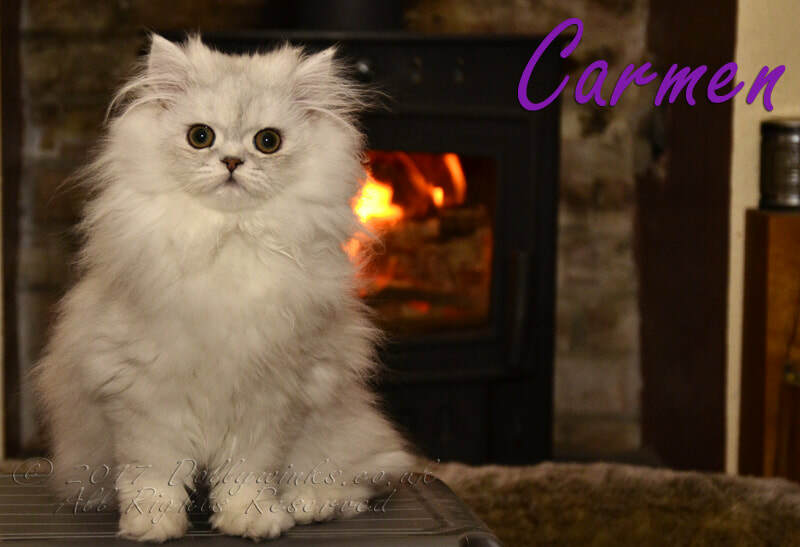 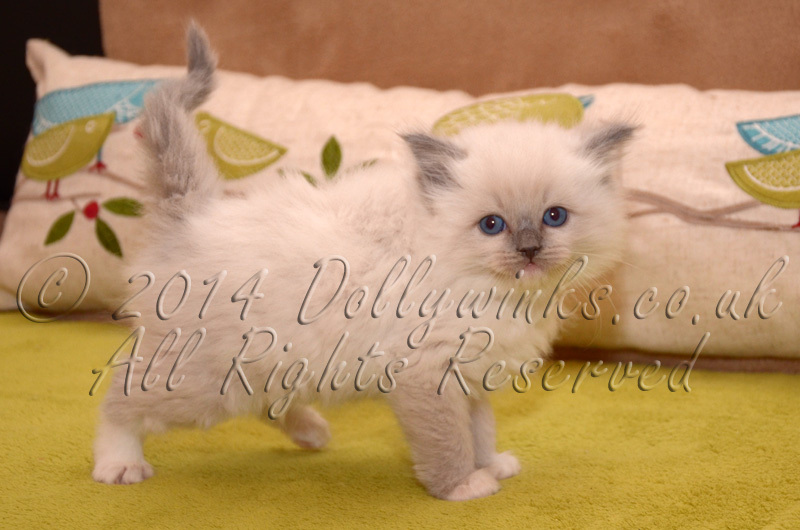 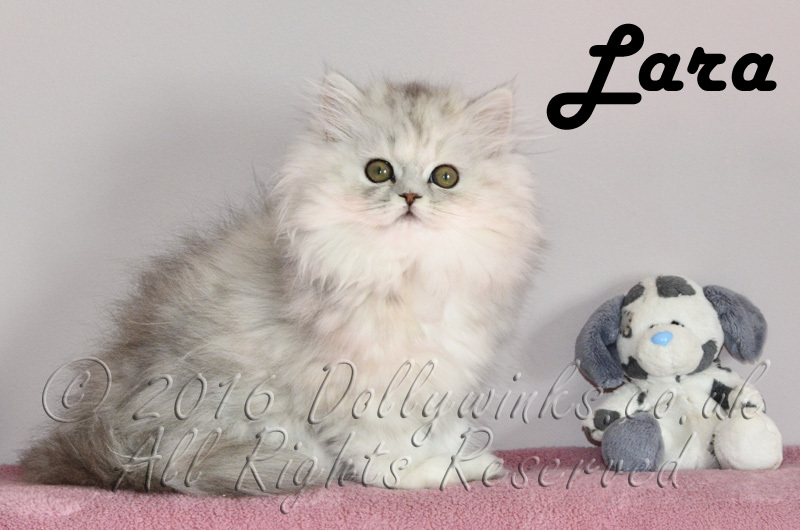 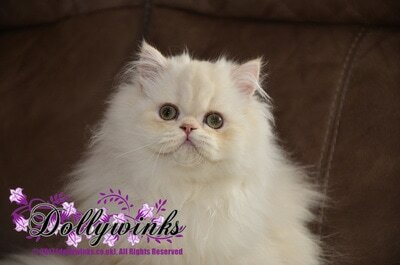 We are proud to announce a litter of Doll faced Persians from Alice and Caspar. The name of this litter is "The Birthday Litter"
We are proud to announce a litter of Chinchilla Persians from Honey and Caspar. 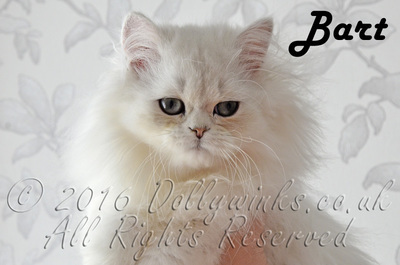 The name of this litter is "The Chubby Litter"
We are proud to announce a litter of Doll faced Persians from Betty and Oscar. 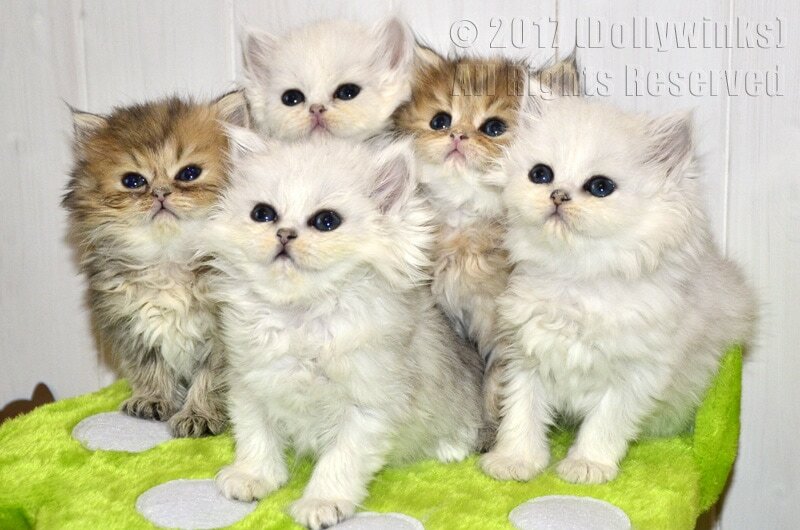 The name of this litter is "The 100"
We are proud to announce a litter of Chinchilla Persians from Molly and Oscar. 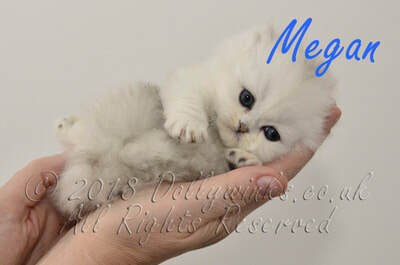 This litter is space themed and is called "The Galaxy" litter. 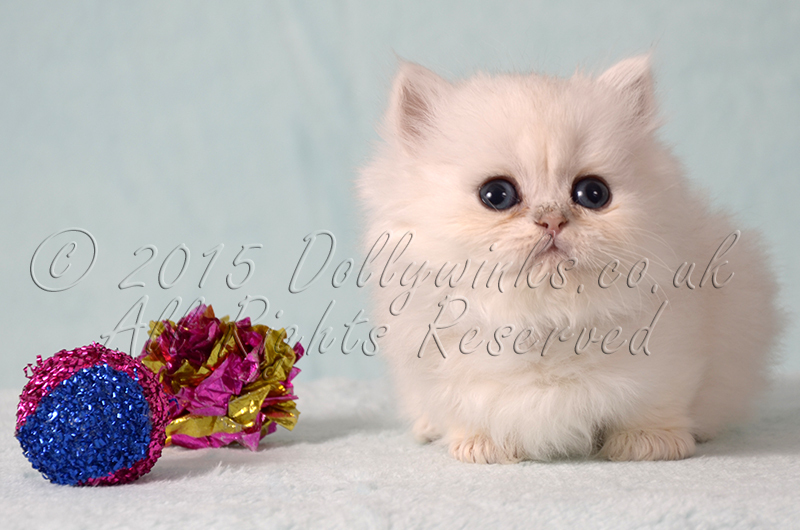 We are proud to announce a litter of Chinchilla Persians from Honey and Caspar. 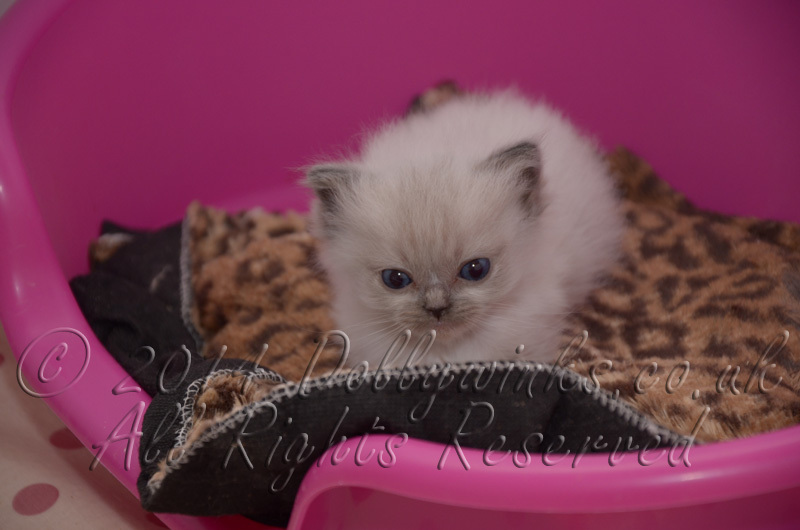 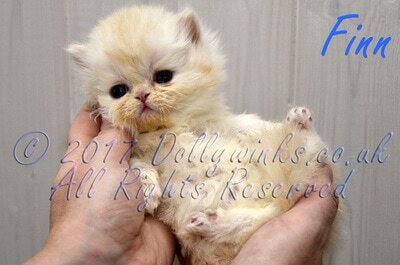 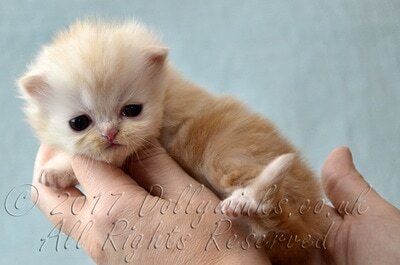 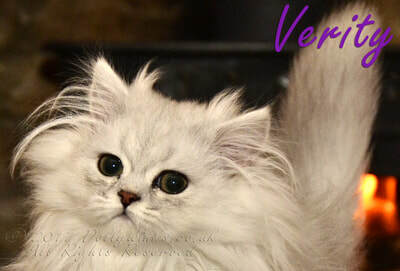 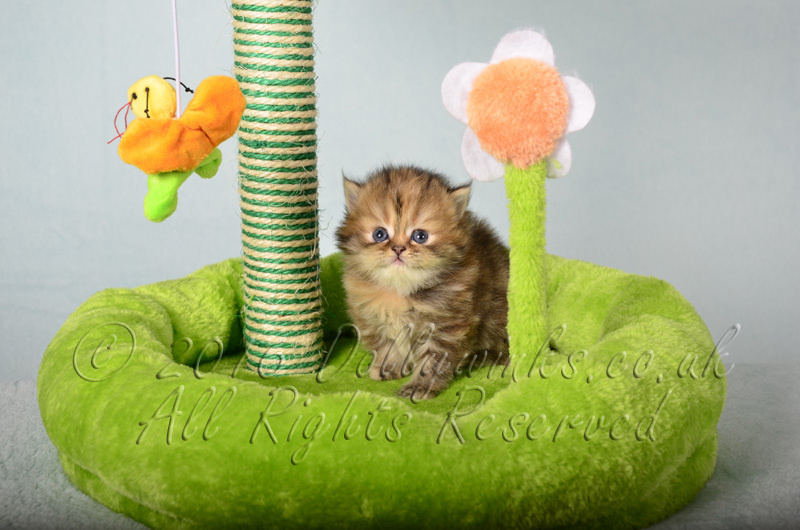 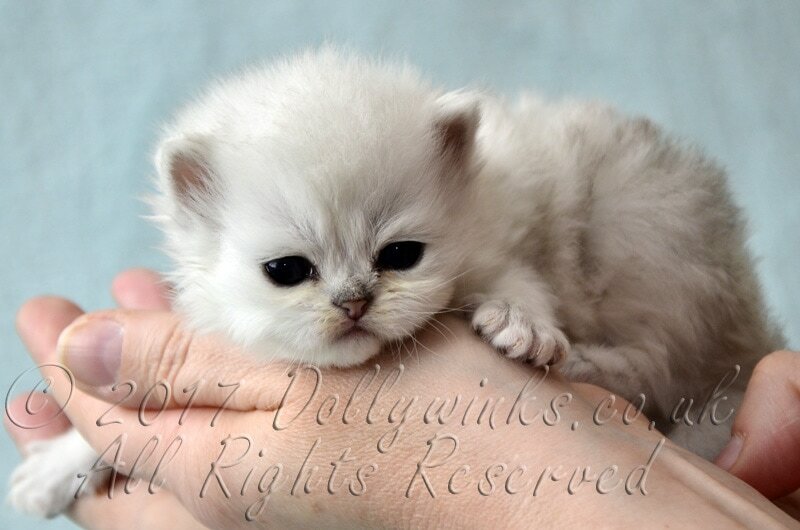 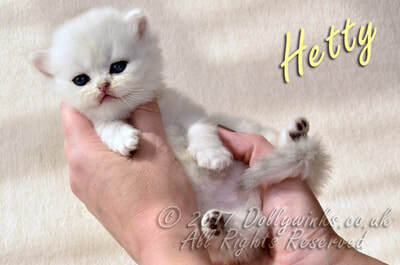 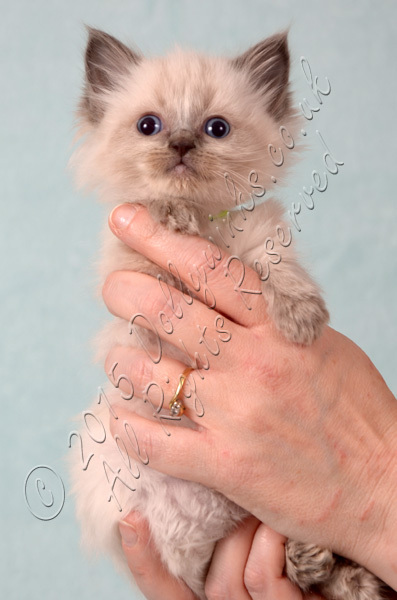 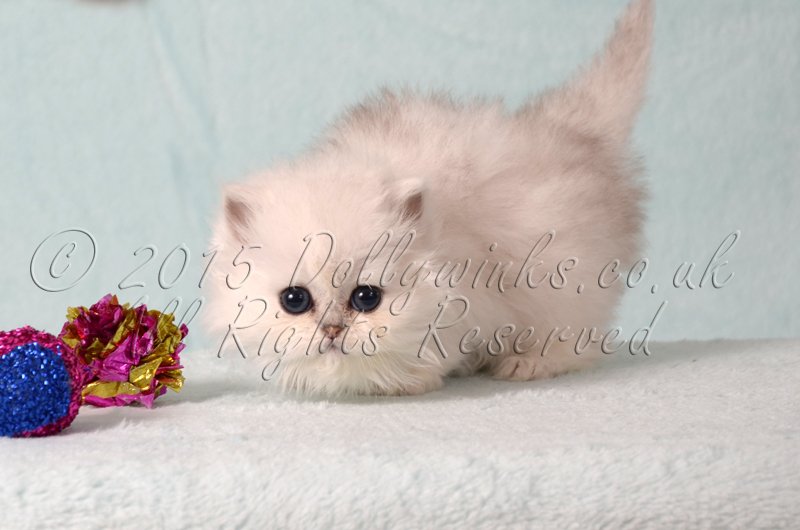 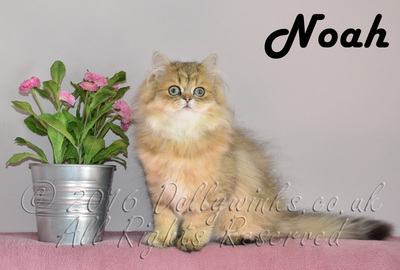 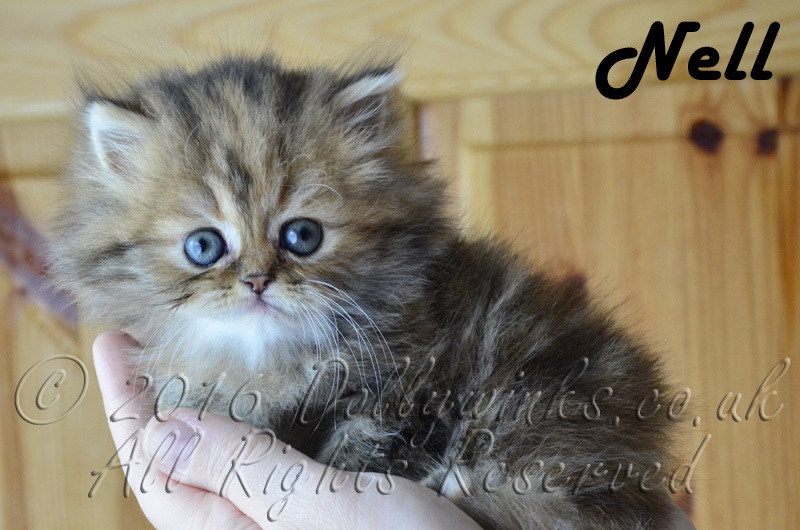 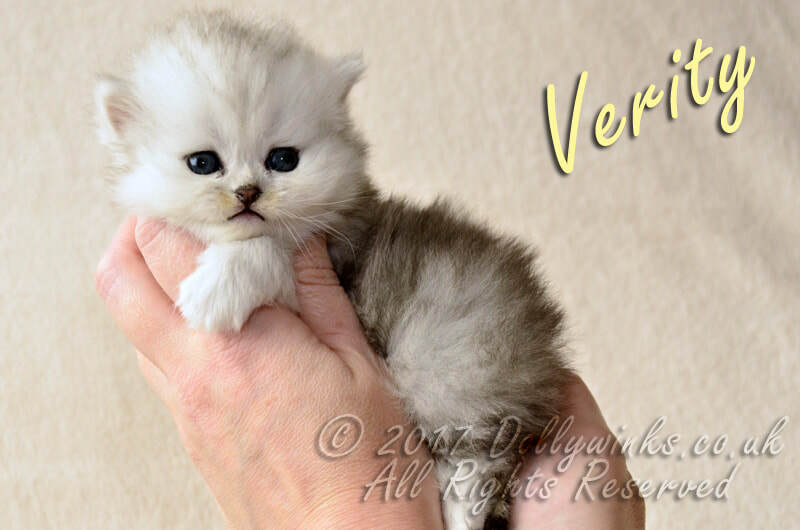 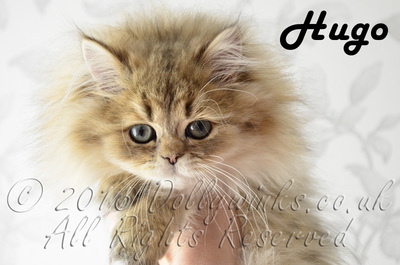 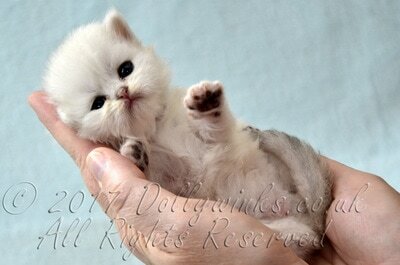 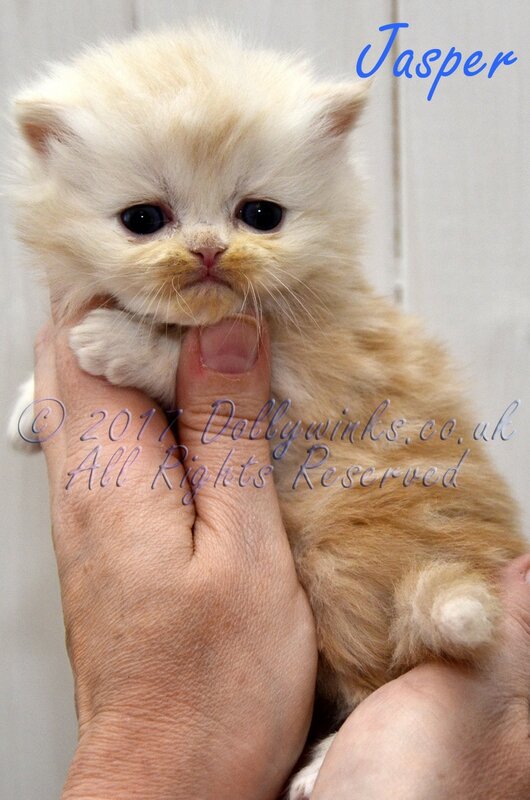 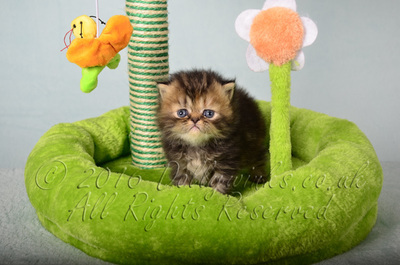 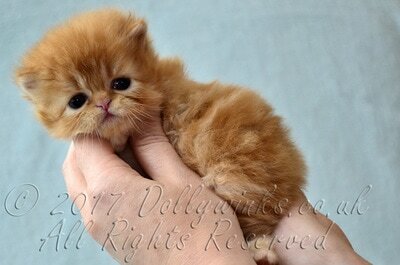 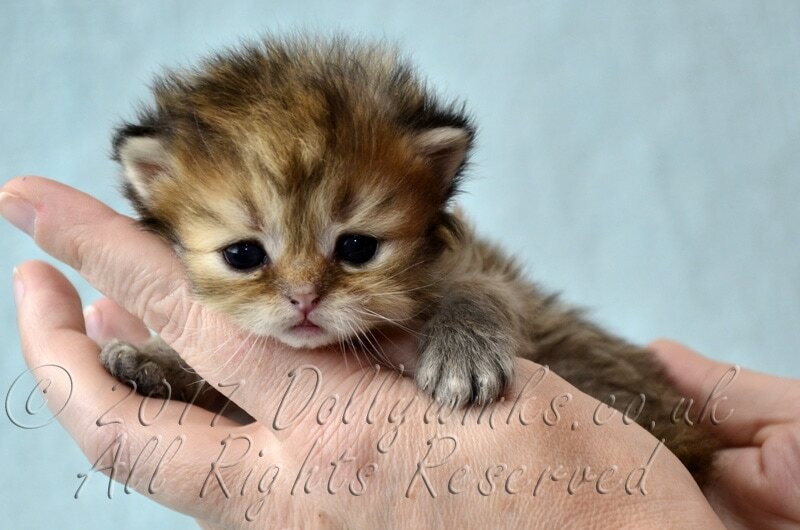 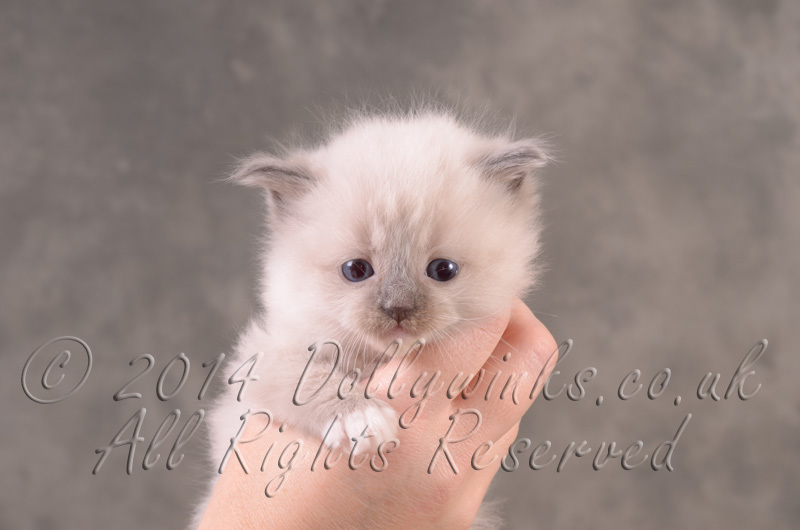 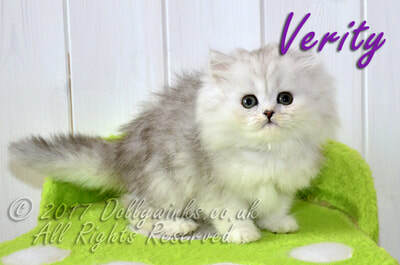 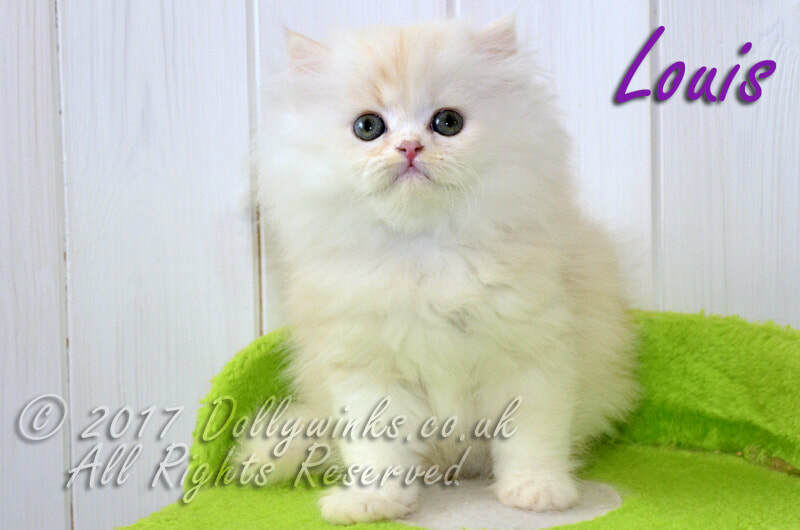 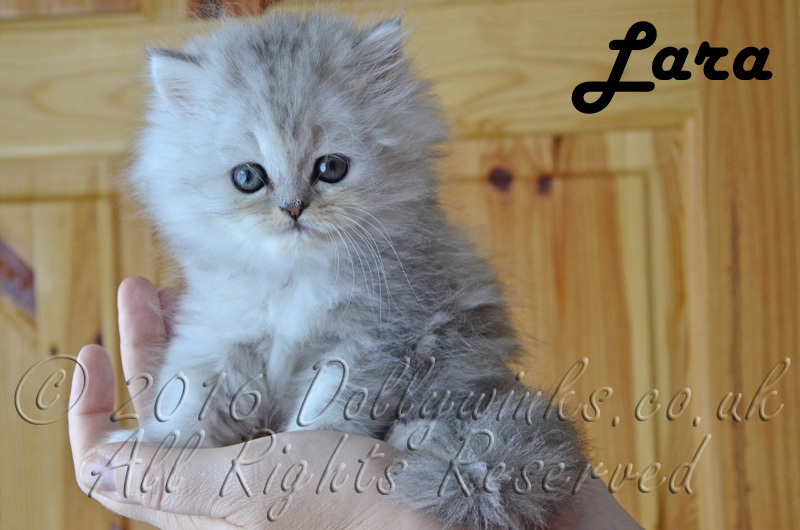 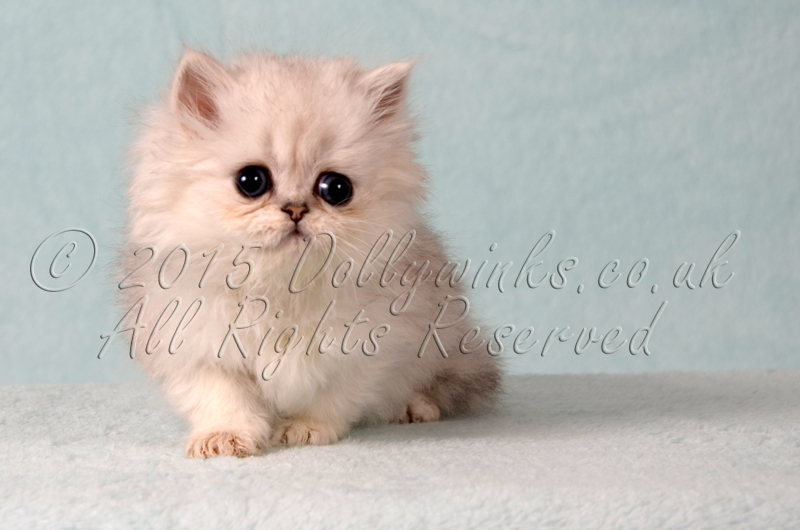 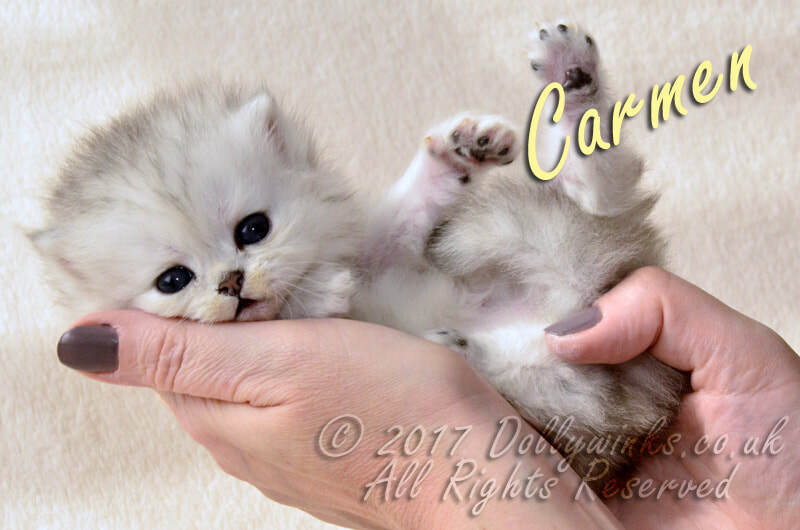 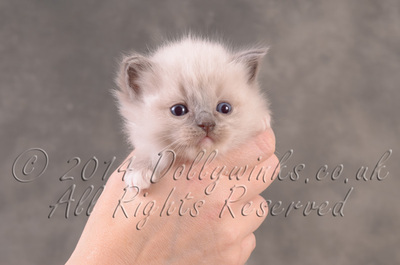 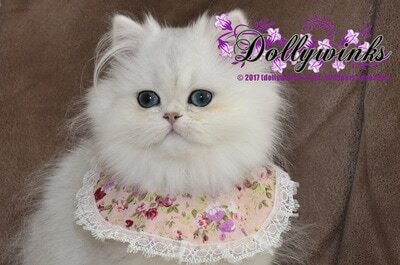 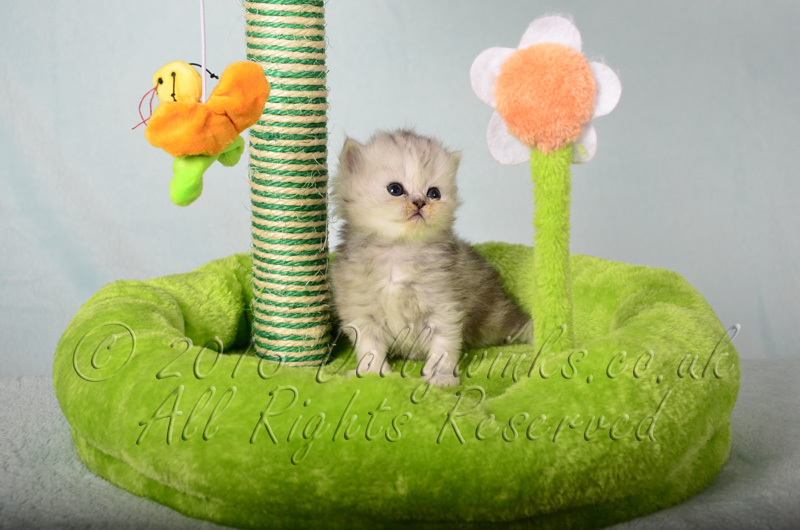 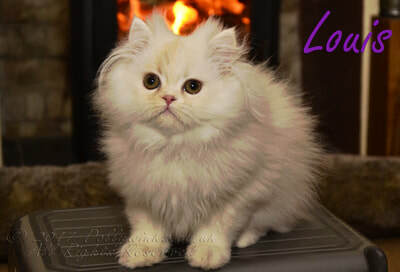 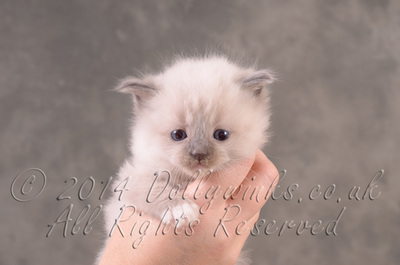 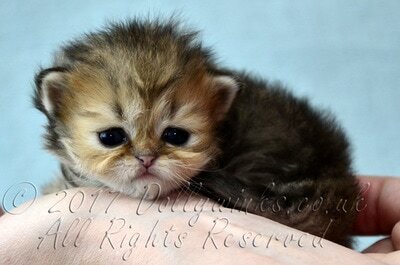 The name of this litter is "Little Gems"
We are proud to announce a litter of Dollfaced Persians from Eden and Caspar. The name of this litter is "Trinity"
We are proud to announce a litter of Chinchilla/ Persians from Betty and Oscar. 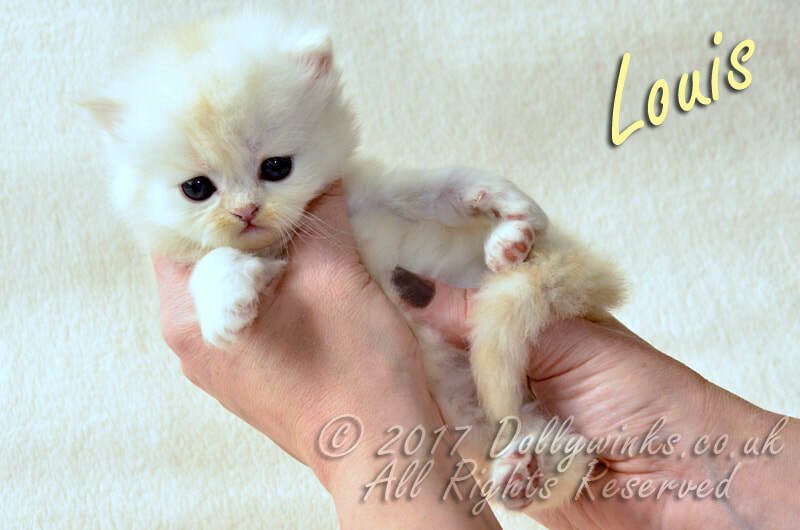 The name of this litter is "Sugar & Spice"
We are proud to announce a litter of Chinchilla/ Persians from Oscar and Molly. 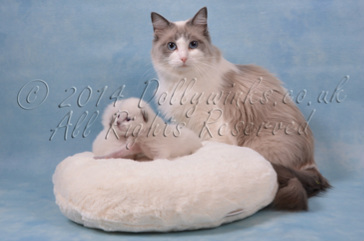 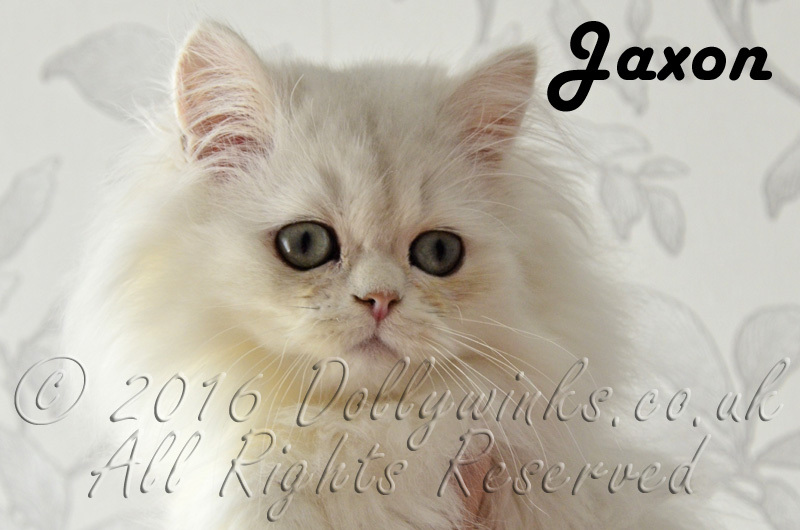 The name of this litter is "Bumper Crop"
We are proud to announce a litter of Ragdoll kittens from Jenson and Lacey. 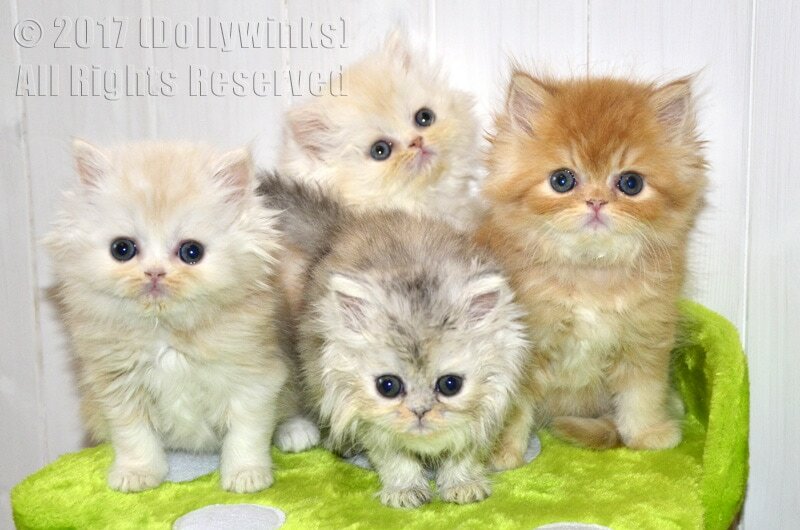 The theme of this litter is "Drinks". 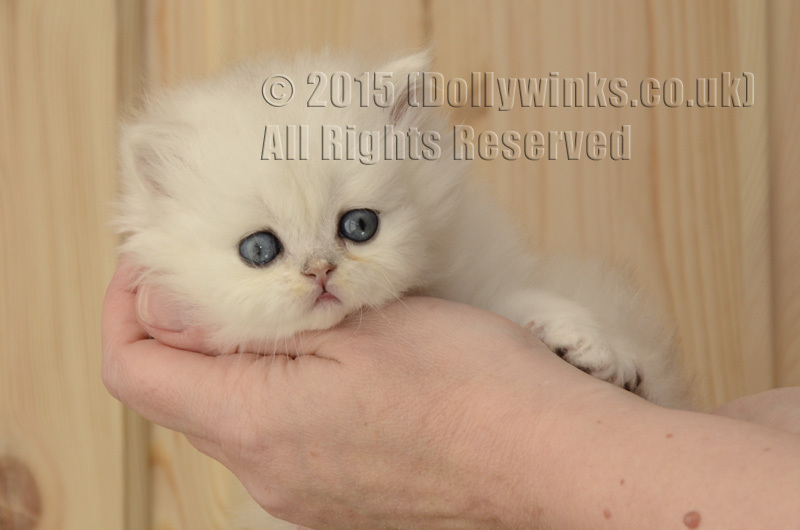 We are proud to announce a litter of Chinchilla/ Persians from Caspar and Honey. 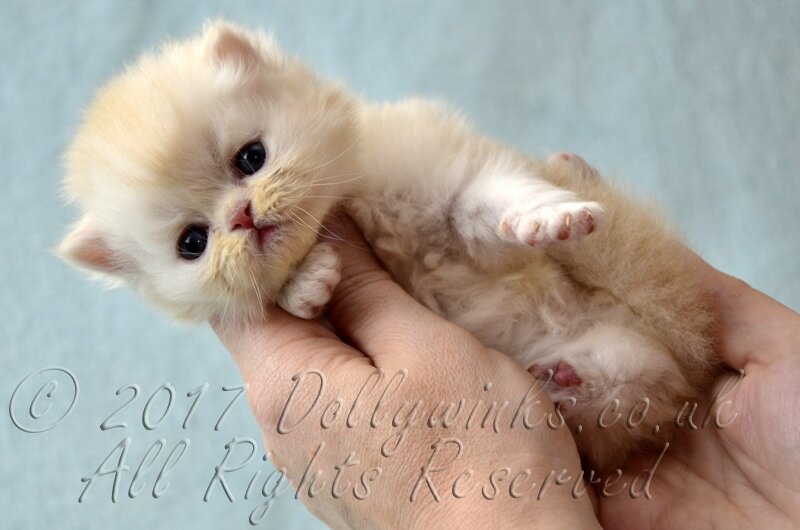 This is her first litter. 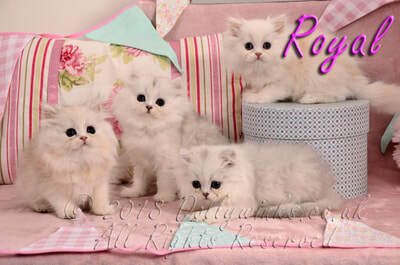 The theme of this litter is "Posh". 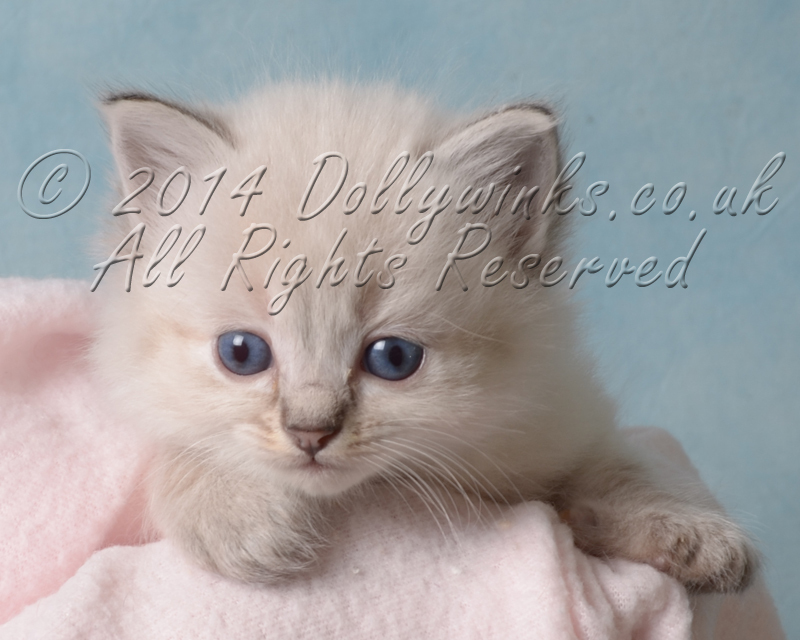 We are proud to announce a litter of ragdoll kittens from Jenson and Kiera. 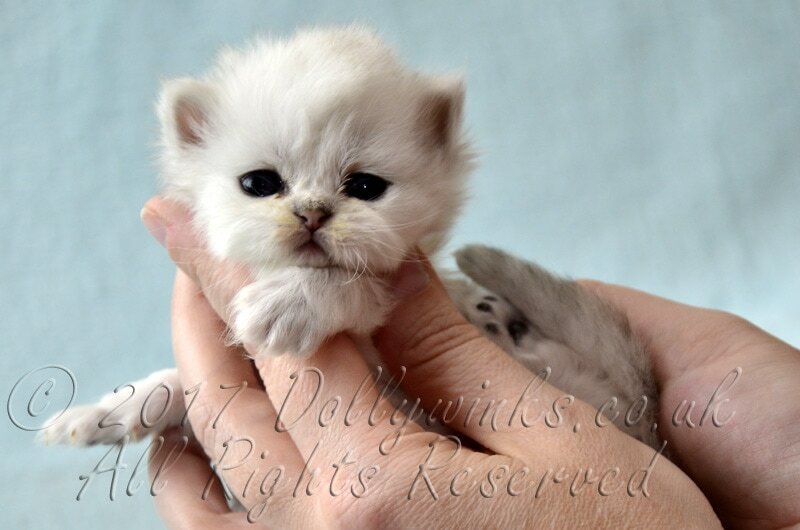 This is her first litter. 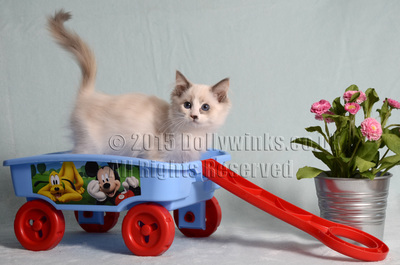 The theme of this litter is "Cars". We are proud to announce a litter of ragdoll kittens from Jenson and Eva. 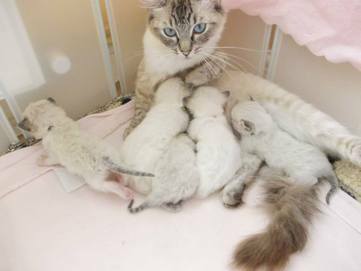 This is the last litter from this mating. 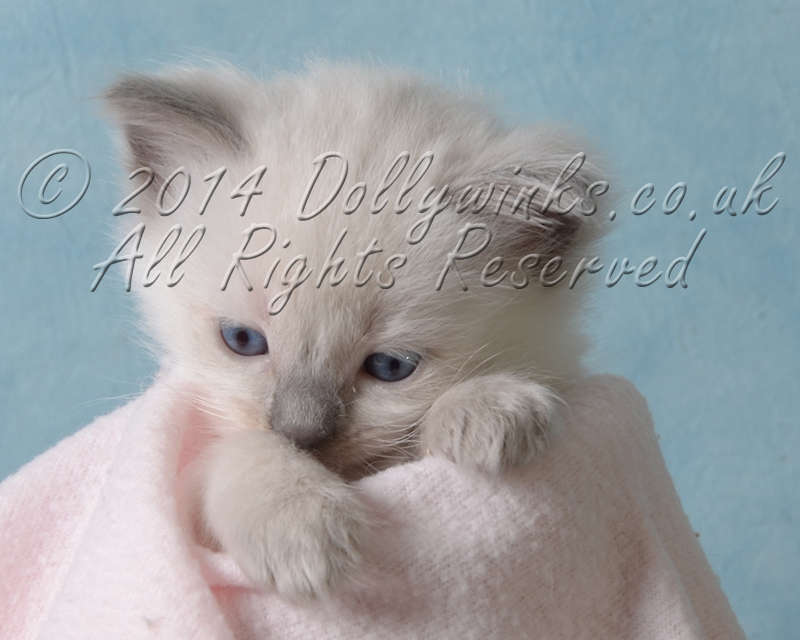 We are proud to announce a litter of ragdoll kittens from Jenson and Lola. The theme for this litter is "Cars". 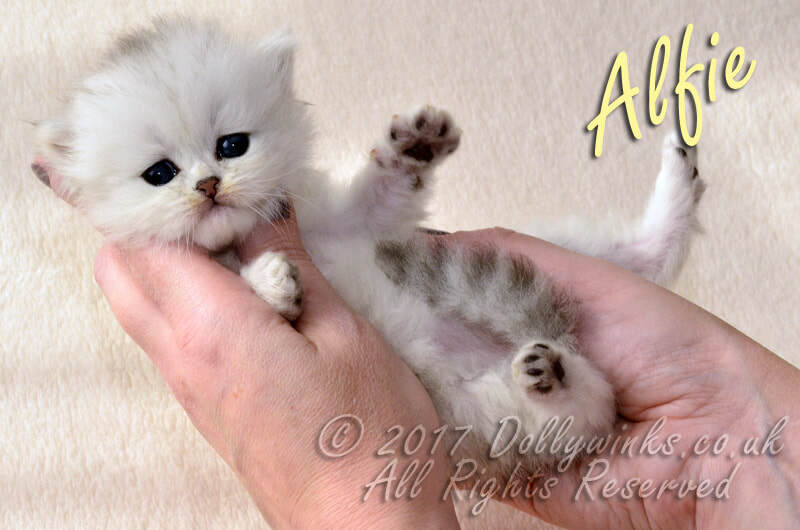 We are proud to announce our first all silver litter of Chinchilla Kittens from Oscar and Molly. The theme for this litter is "Vintage". 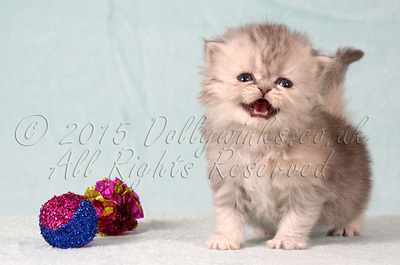 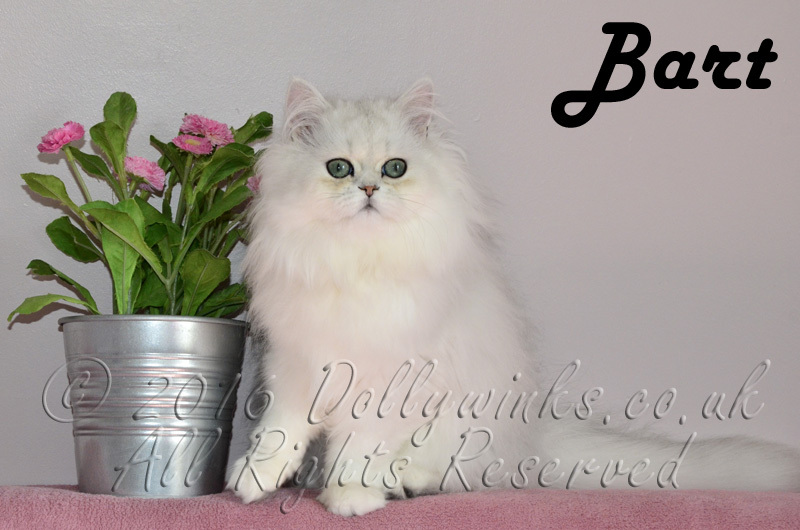 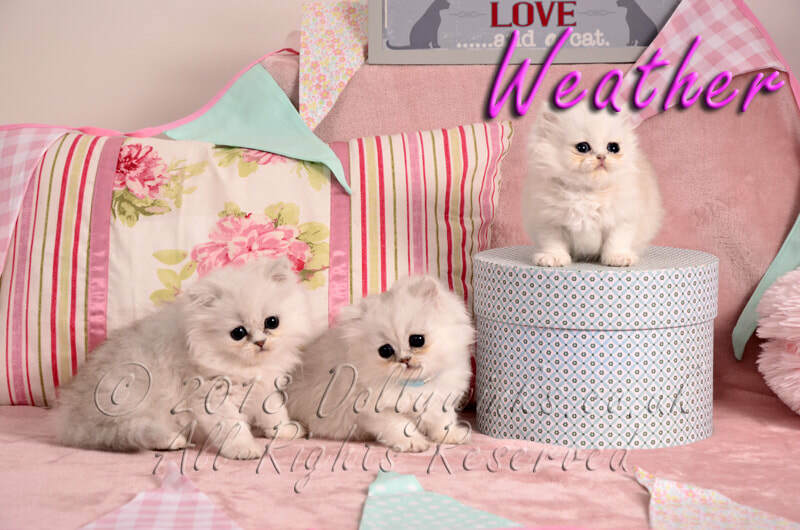 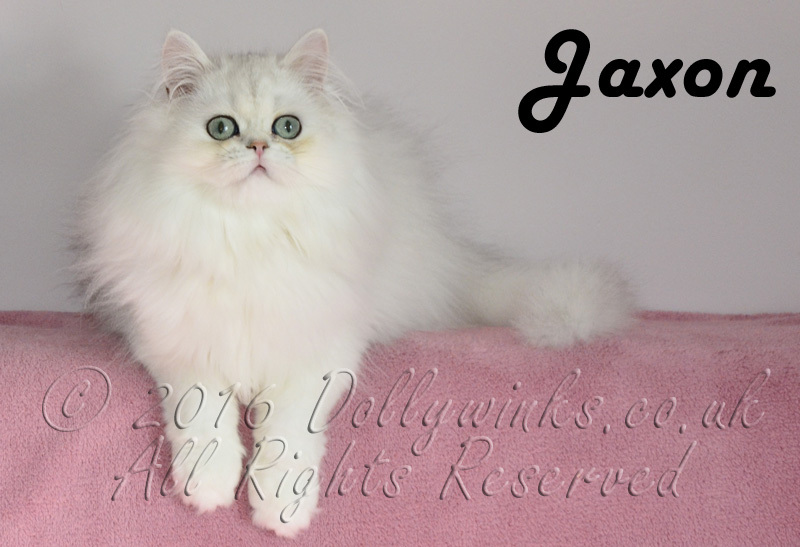 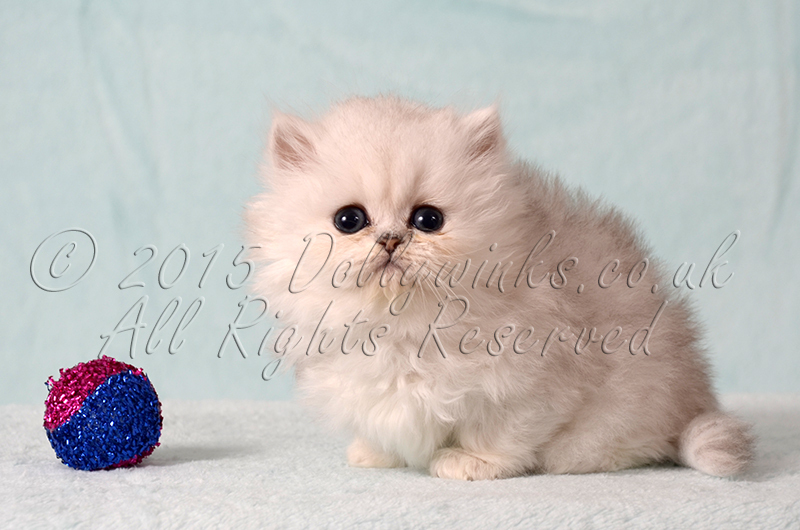 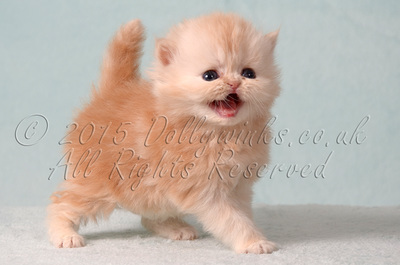 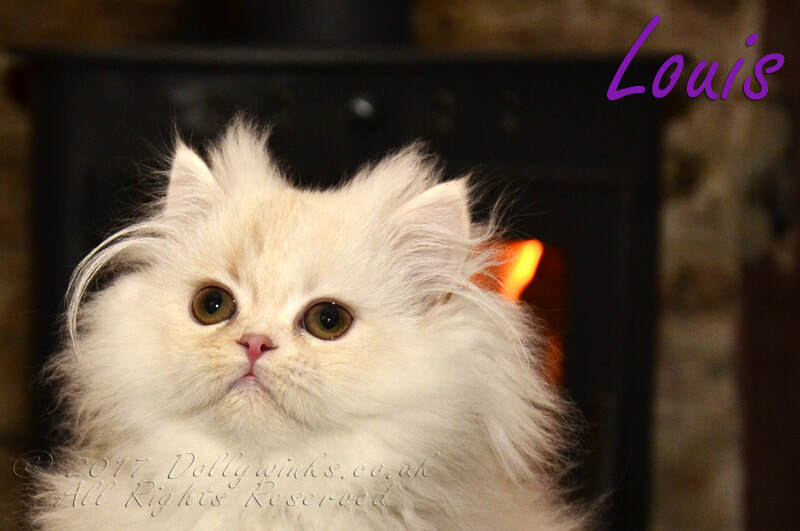 We are proud to announce this extra special litter of dollfaced persians from the mating of Oscar and Betty. 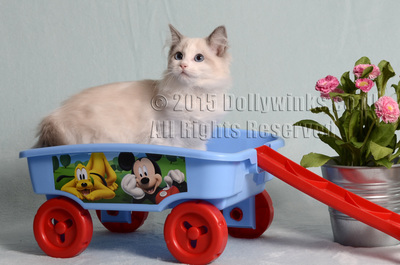 The theme of this litter is "Special". 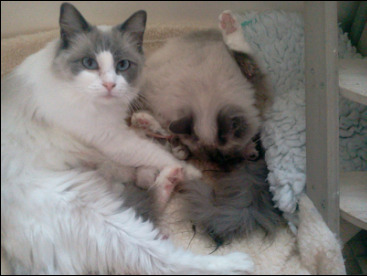 We are proud to announce that Purdy / Jenson have had a litter of 2 kittens. 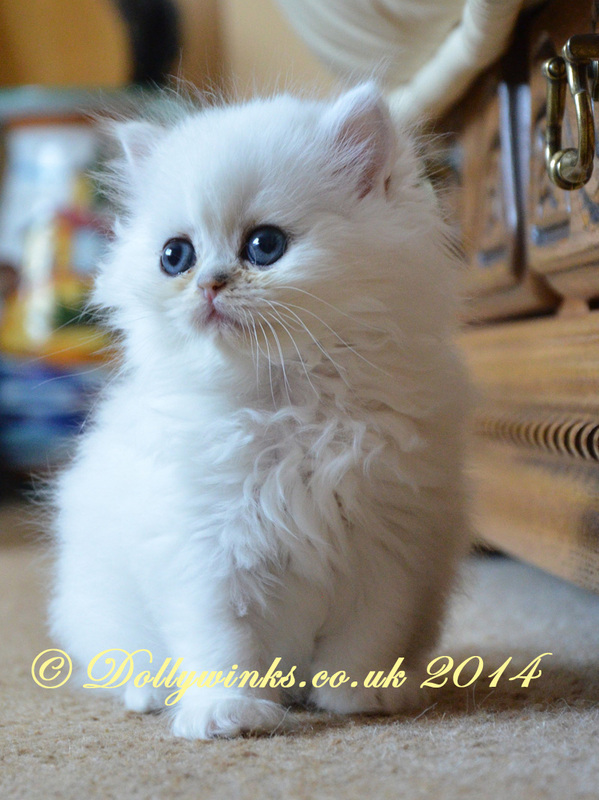 We are proud to announce that Bliss / Jenson have had a litter of 4 kittens. 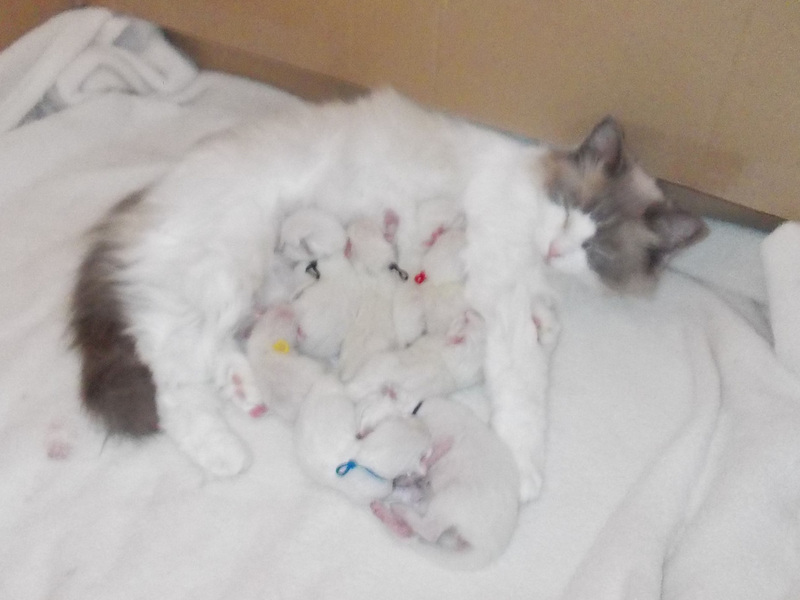 We are proud to announce that Lacey / Jenson have had a litter of 5 kittens. 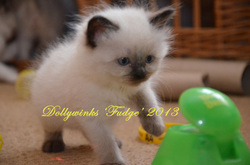 We are proud to announce that Lola / Jenson have had a litter of 2 Ragdoll kittens. 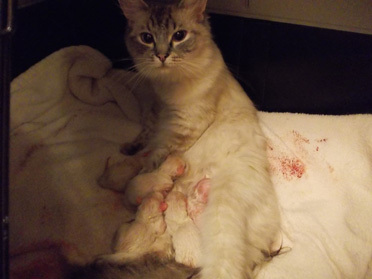 We are proud to announce that Molly / Oscar have had a litter of 5 Chinchilla kittens. 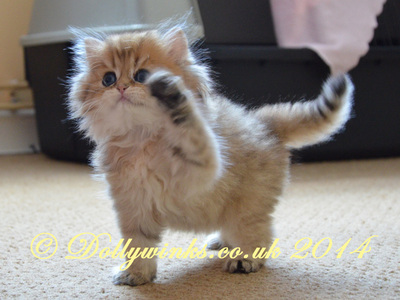 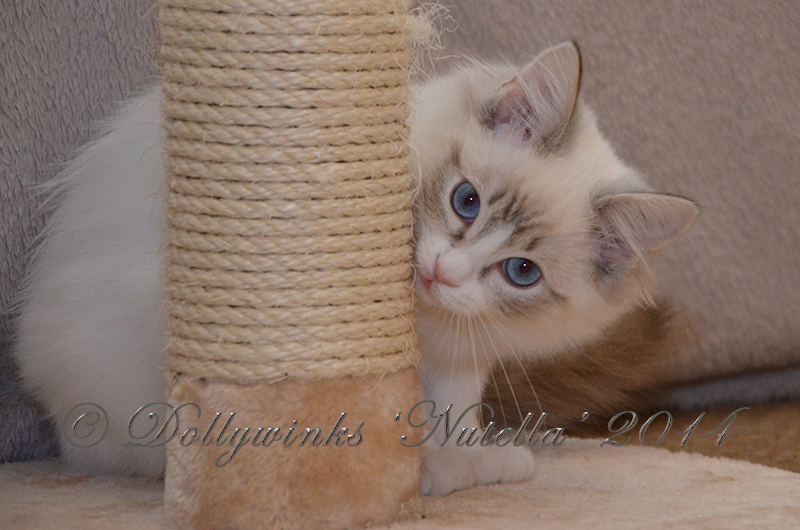 Presenting Dollywinks "Nutella" a Chocolate bi colour tabby female available on GCCF active/ breeding outside of UK. She was born 4th october 2013 and has been dna tested as chocolate and hcm negative. 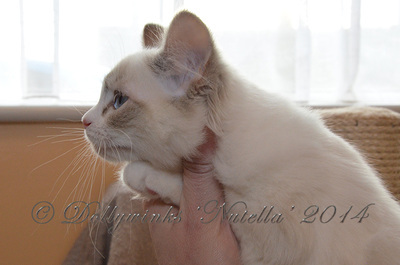 Nutella is a bold confident girl with great eye colour and nice profile and has a silky type coat/ fur texture. 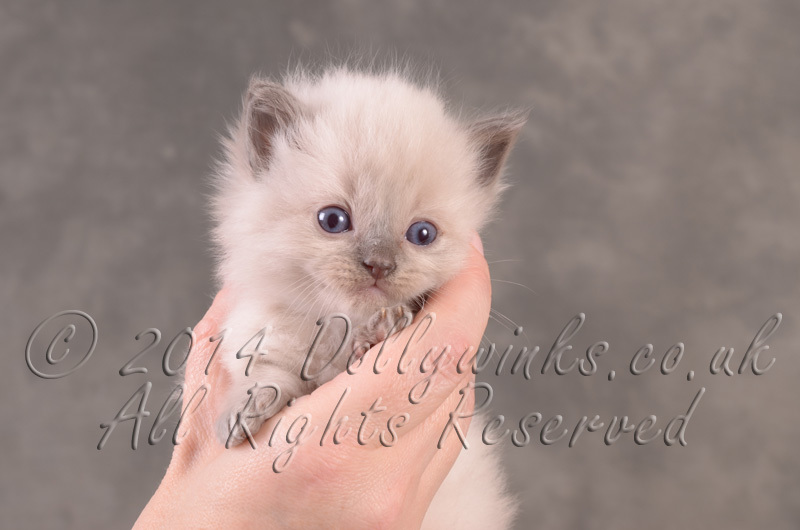 She is happy in a group , but just as happy one on one for snuggle time. For any further details please feel free to contact us. 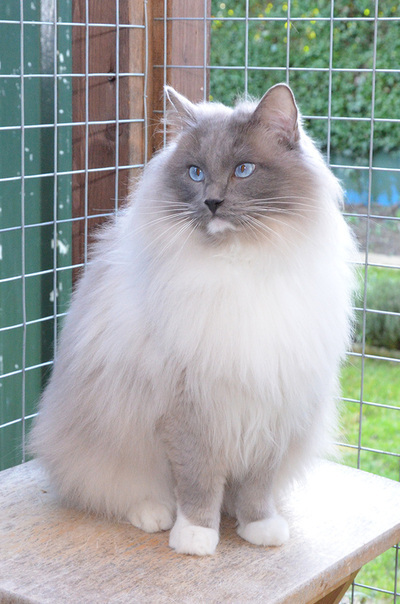 He was matched to his previous family as a bold and confident chap who could cope with a boarder collie companion but liked the out door life of a dog a bit too much. After some time here he ia available as pet neuter and would really suit any family environment as he is fine with dogs, strangers, children and even kittens. 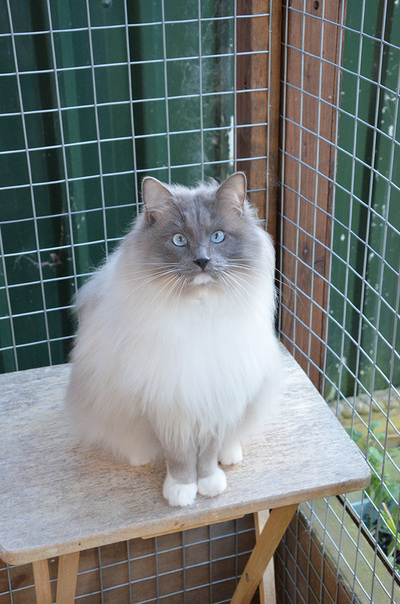 BUT he does love and tends to pine for his outside space, so would need supervised visits to snoop round the garden or in a purfect world specialised cat fencing, he would make ideal companion to a stud boy which his role is now with his dad Jenson. 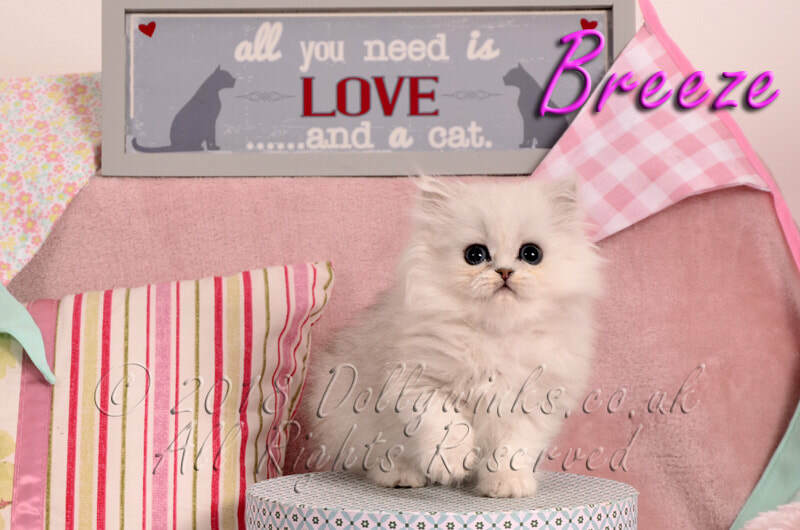 For any further details please feel free to contact us. 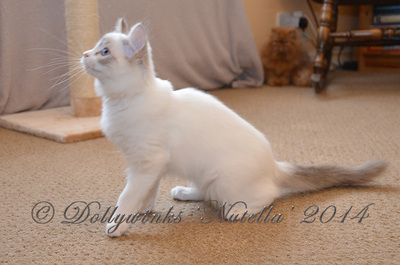 This litter consisting of bicolour and colour points Ragdoll kittens are from a mating of 'Lacey' (Mydolls Laceylou) and 'Luke' CH Partypalace Cwtchycats. 3 ragdoll males - colours to follow. 2 ragdoll females - colours to follow. 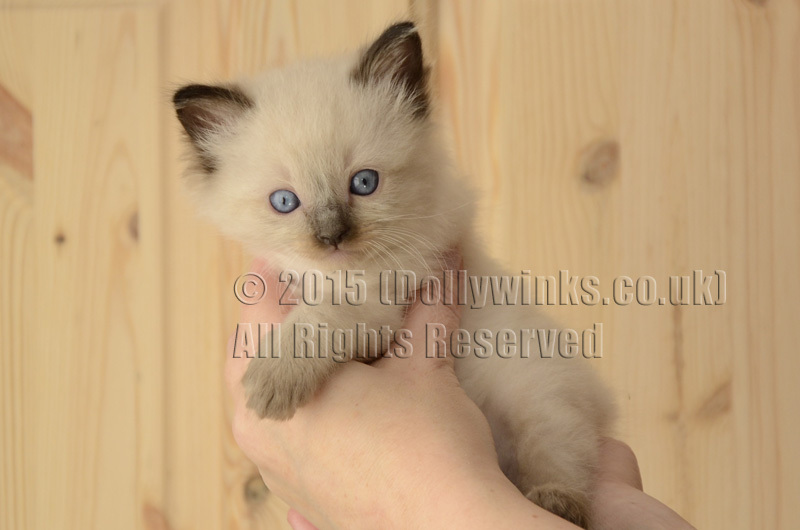 1st Ragdoll litter to contain tabby markings here at Dollywinks. 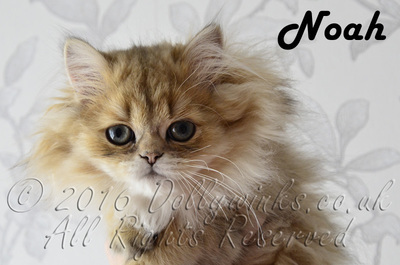 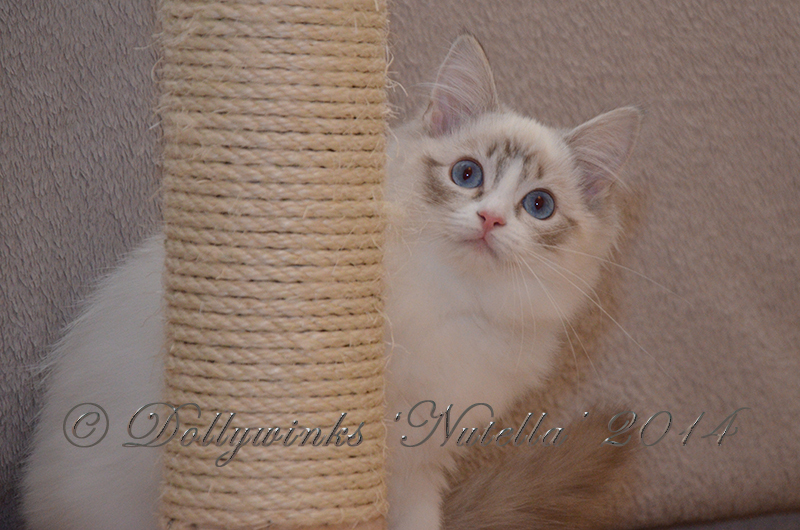 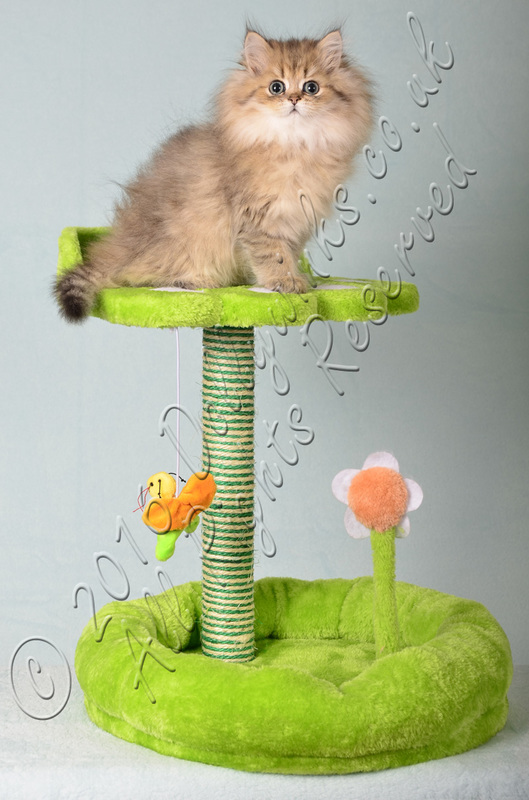 Nutella is a chocolate bi colour tabby female ragdoll kitten. 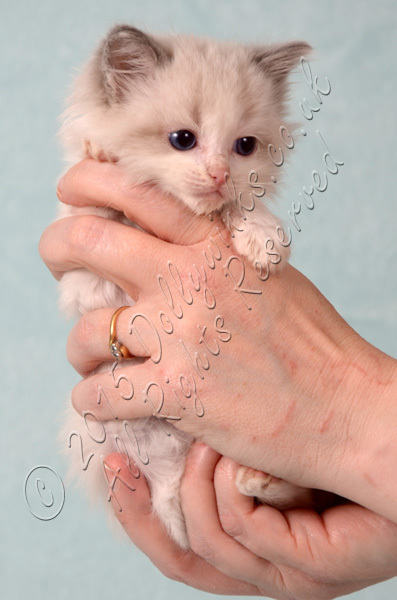 She has been DNA tested to confirm colour. 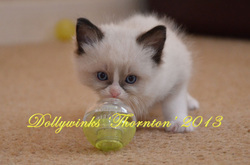 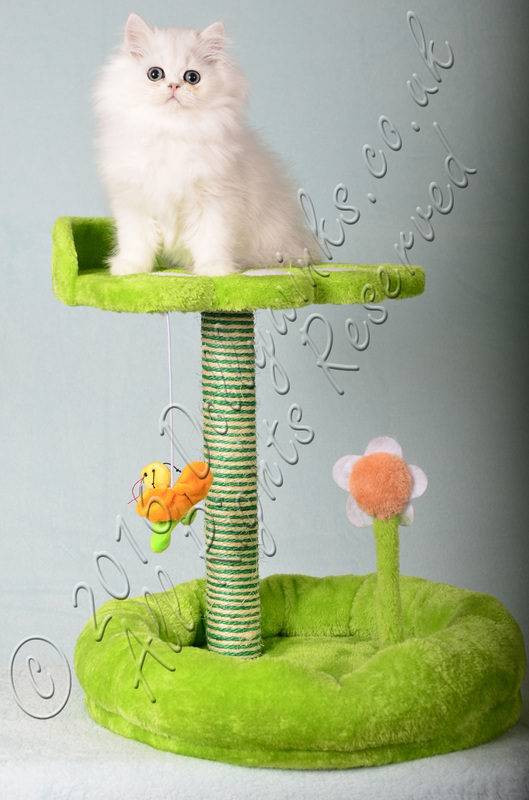 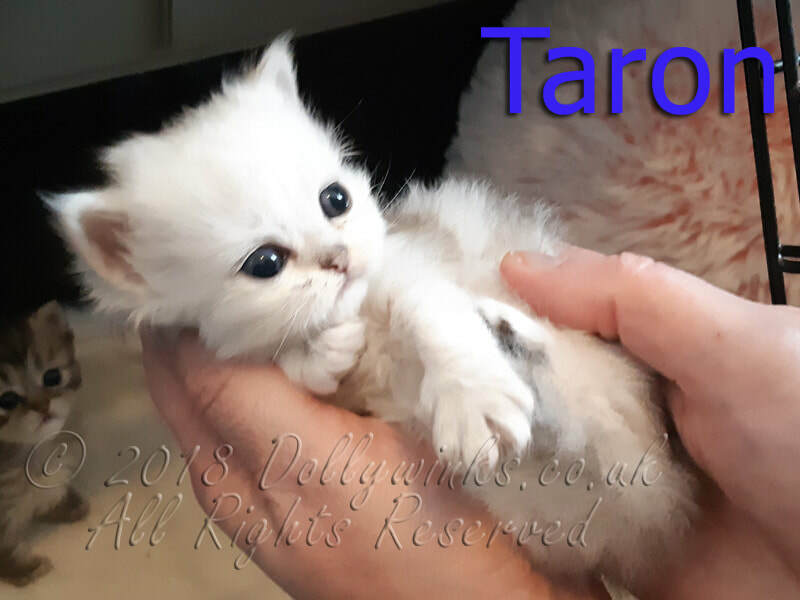 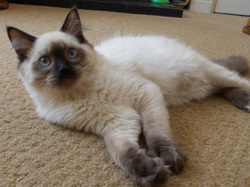 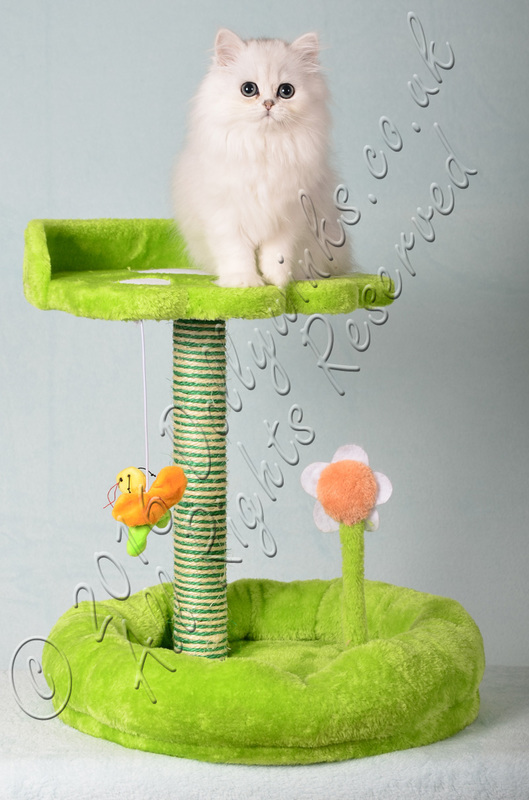 Thornton is a seal bi colour male ragdoll kitten. 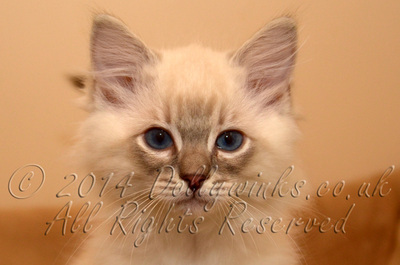 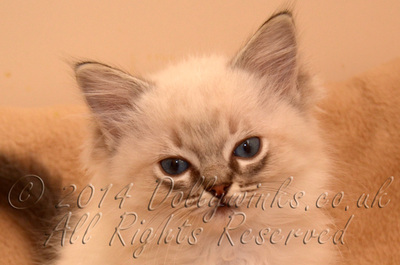 Ganache is a chocolate (tbc) tabby point male ragdoll kitten. 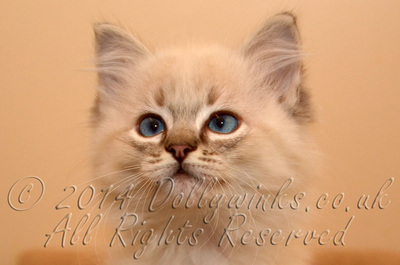 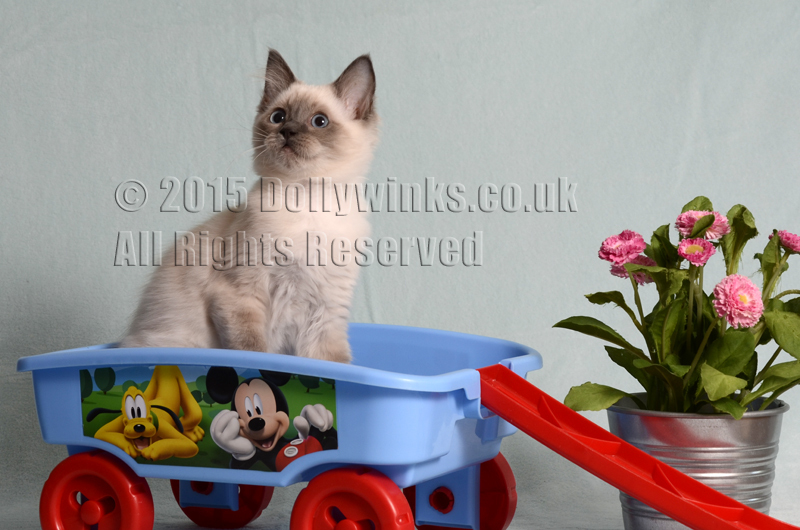 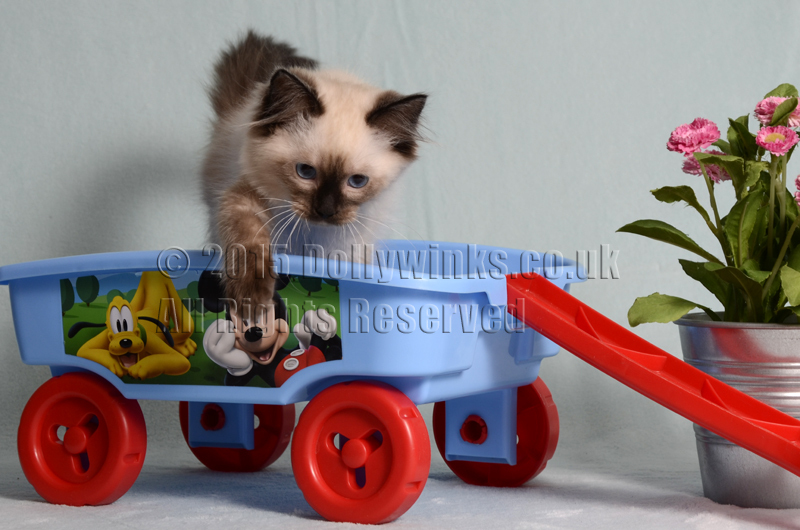 Toblerone is a blue bi colour tabby male ragdoll kitten. 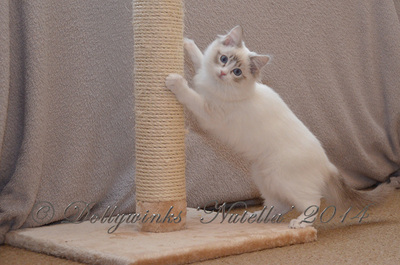 Fudge is a seal colour point female ragdoll kitten. 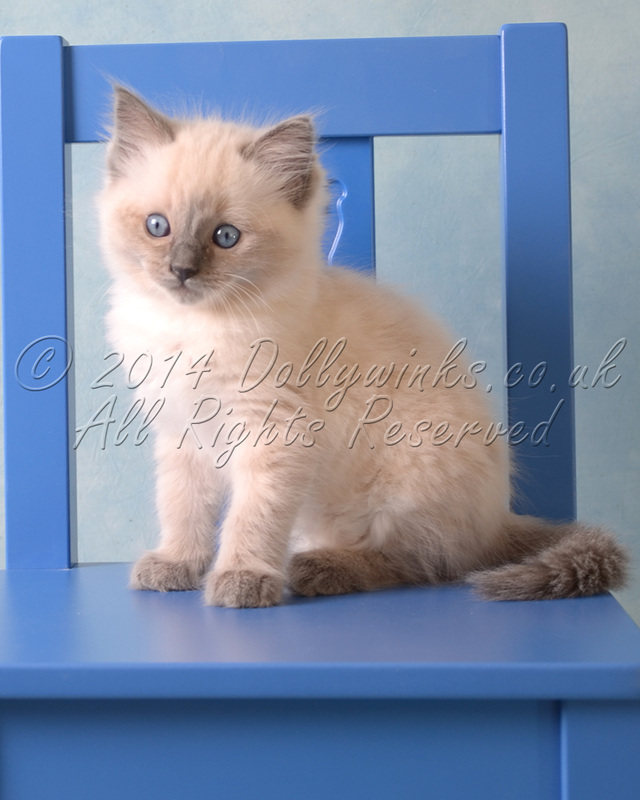 This all blue litter consisting of bicolour and colour point Ragdoll kittens are from a mating of 'Lola' (Dollywinks Showgirllola) and 'Jenson' (Ladydoll Simeon). Ready end of November 2013. 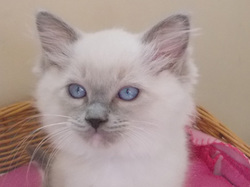 We are proud to announce that Lola / Jenson have had a litter of 7 Ragdoll kittens that consist of:-1 ragdoll males - 1 x blue colour point. 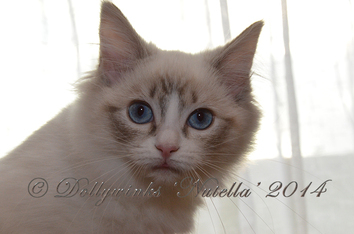 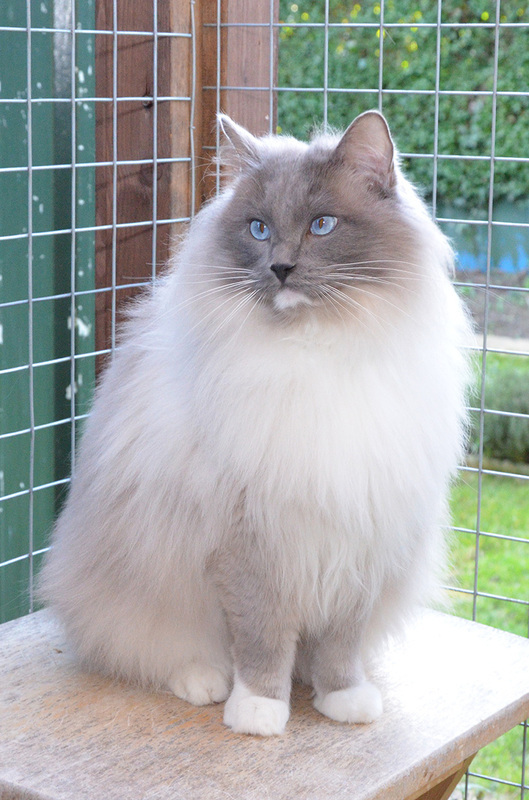 4 ragdoll females - 1 x blue colour point and 3 x blue bi-colour. 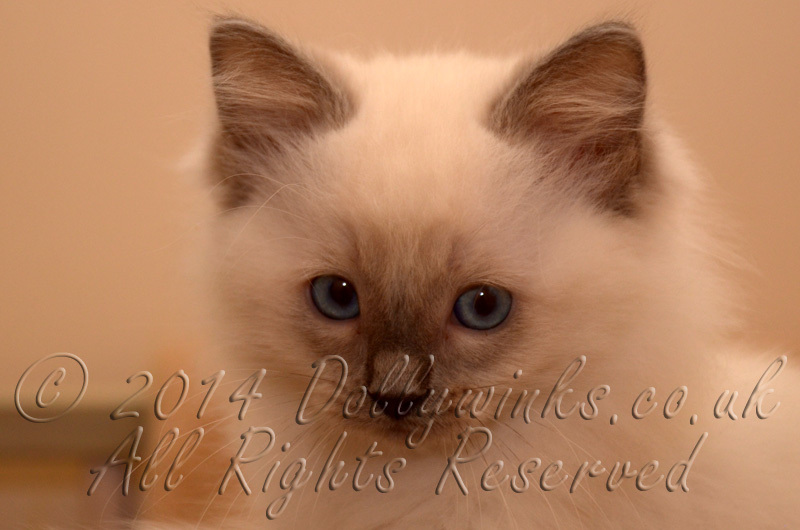 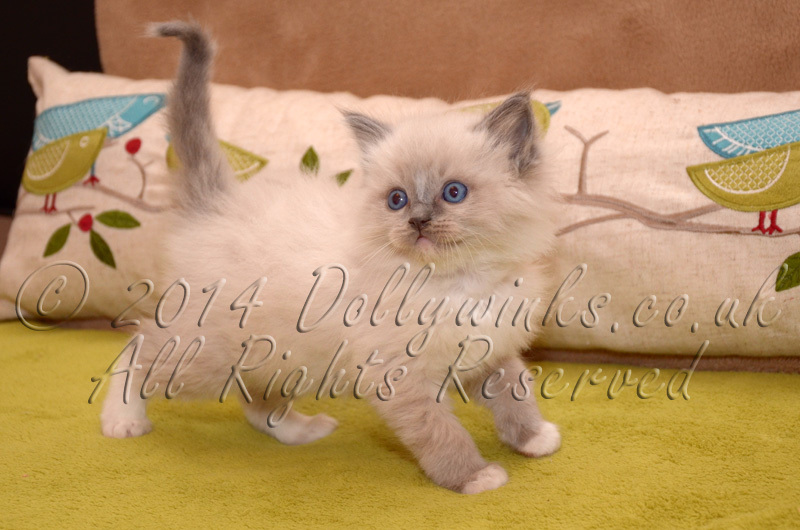 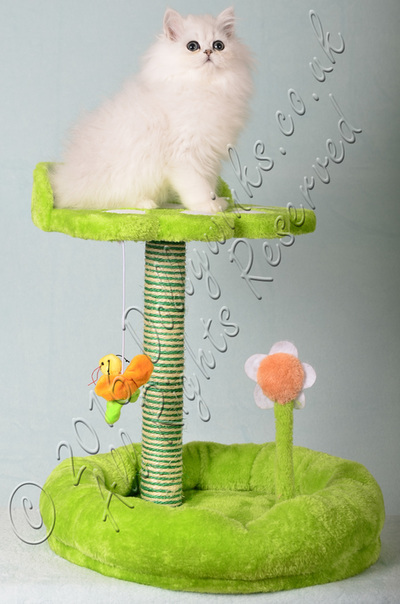 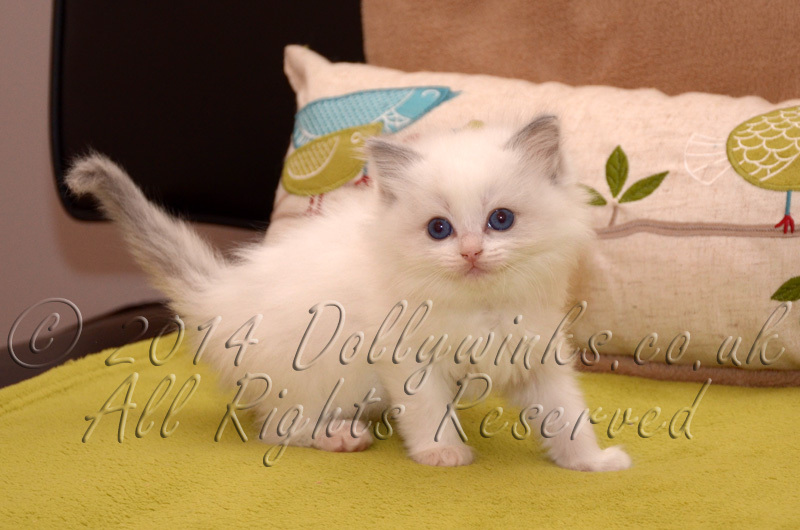 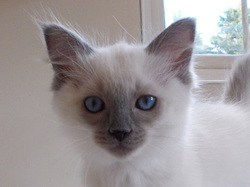 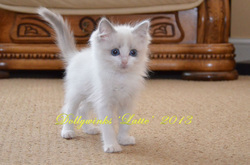 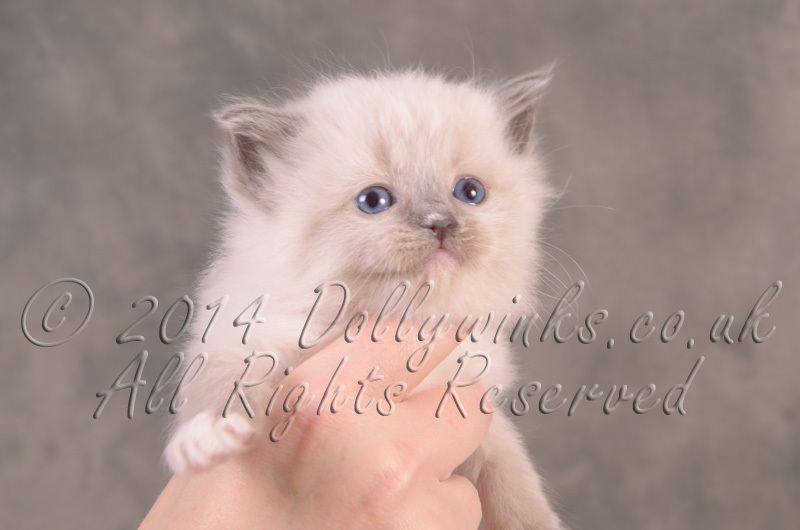 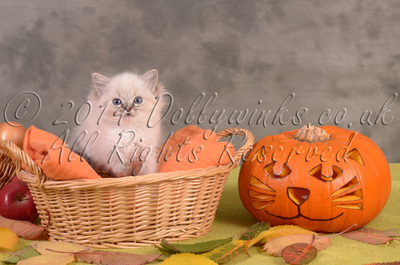 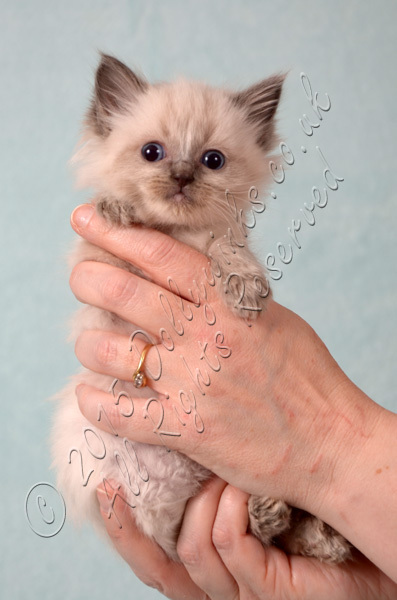 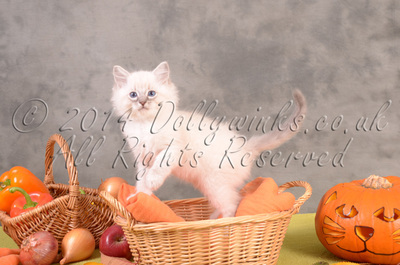 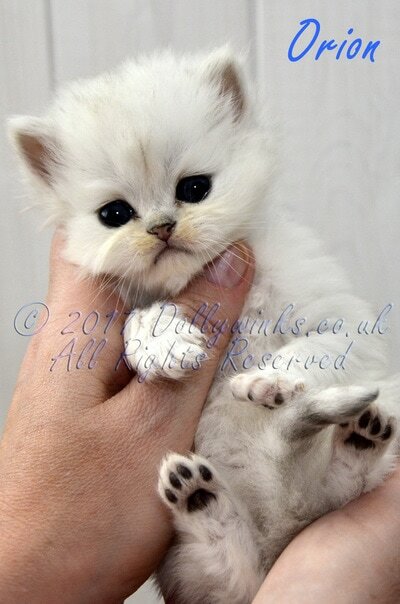 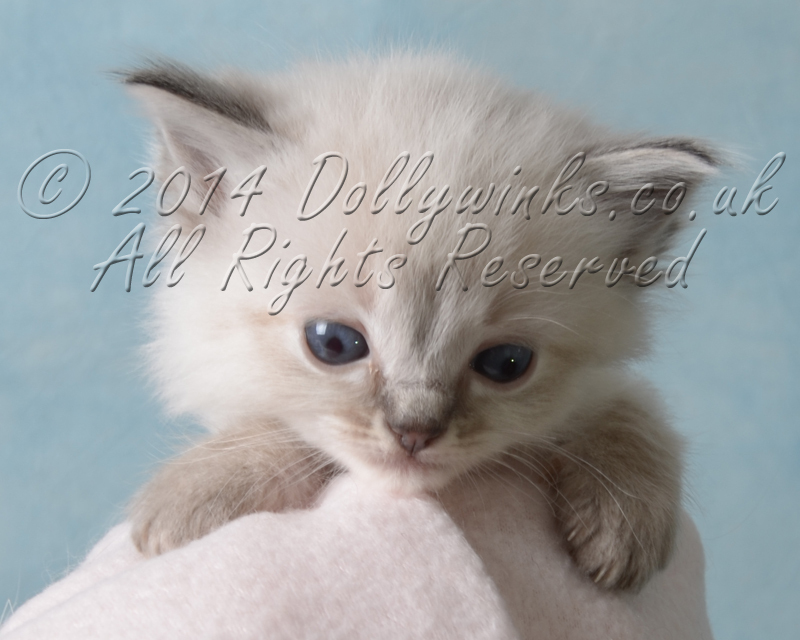 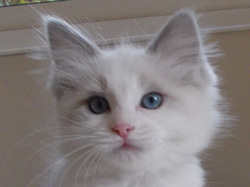 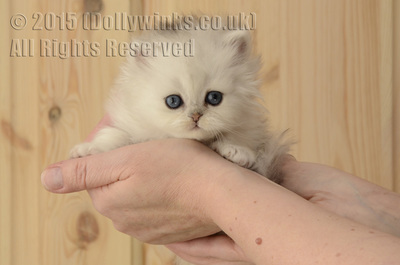 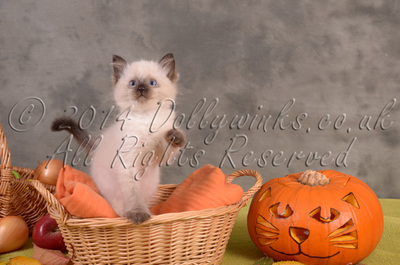 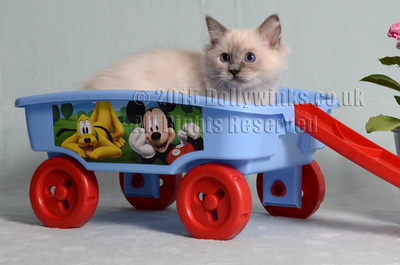 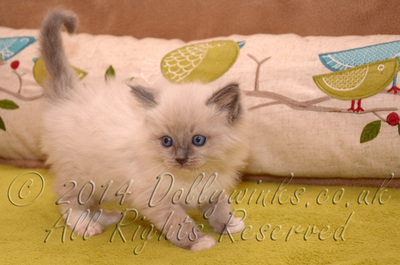 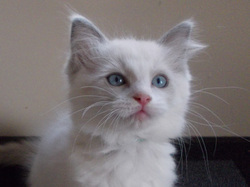 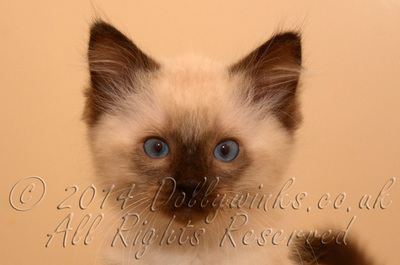 Latte is a blue bi colour female ragdoll kitten. 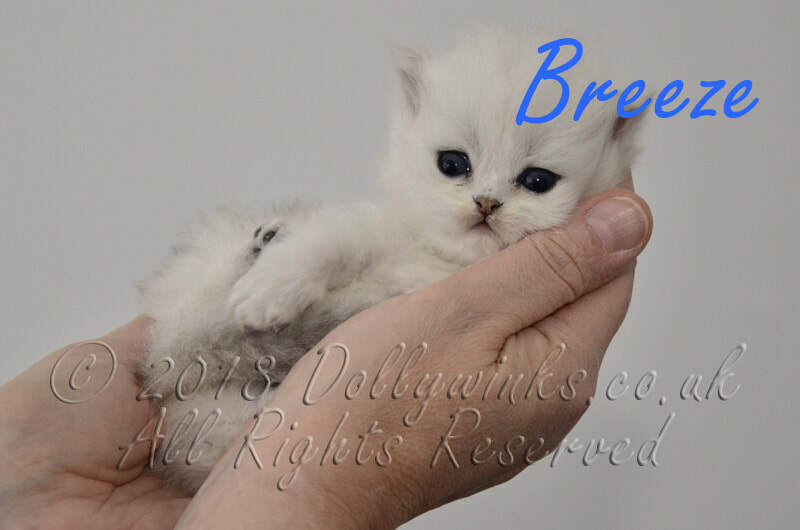 She is the little one in the litter and will be available soon. 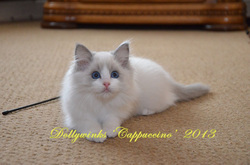 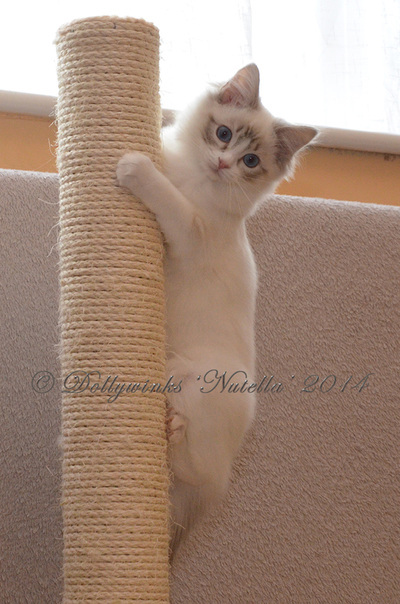 Cappuccino is a blue bi colour female ragdoll kitten. 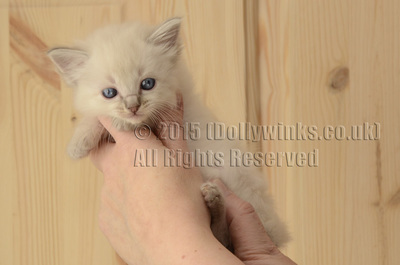 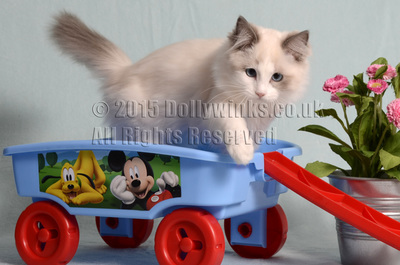 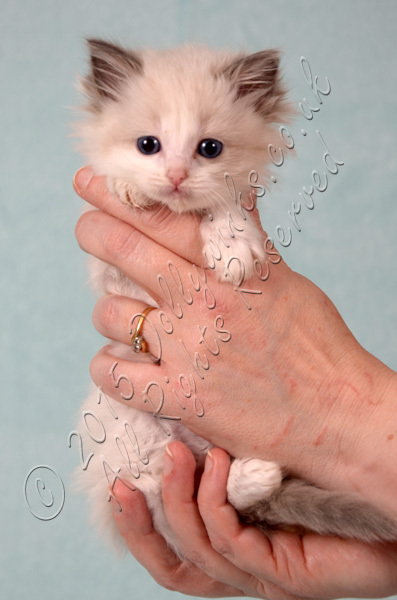 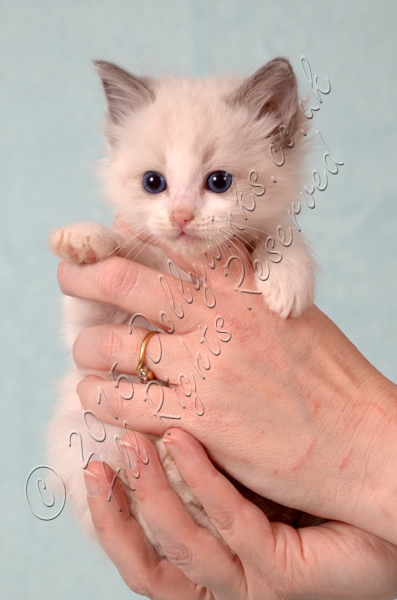 Romano is a blue colour point female ragdoll kitten. Mocha is a blue bi colour female ragdoll kitten. 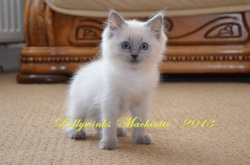 Machiatto is a blue blue colour point male ragdoll kitten. 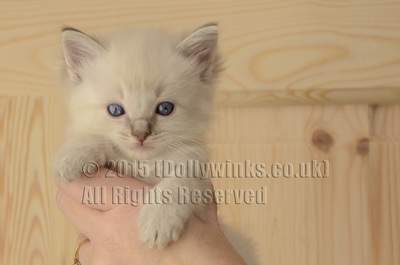 These lovely natured Ragdoll kittens are seal colour point. 'Chuckle Brothers' are from a mating of 'Eva' (Filensio Eva-So-Special) and 'Jenson' (Ladydoll Simeon). 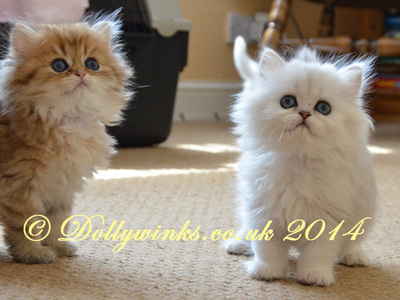 These are confident, bold and very playful and love all the attention they can get. 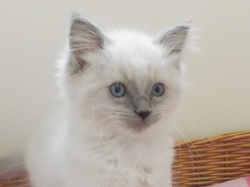 Tomi is a seal colour point male ragdoll kitten. The last of the 'chuckle brothers' due to find a home. 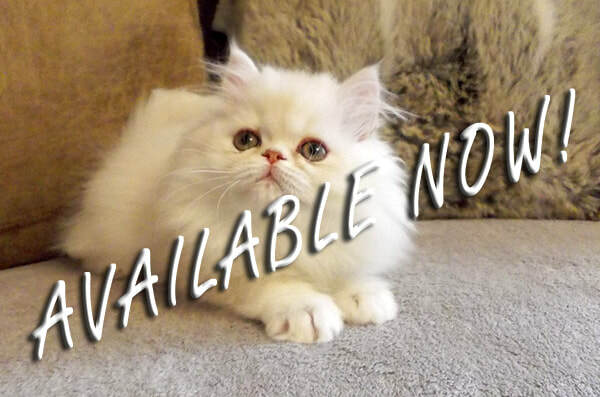 He has had his early neutering operation and is available now. 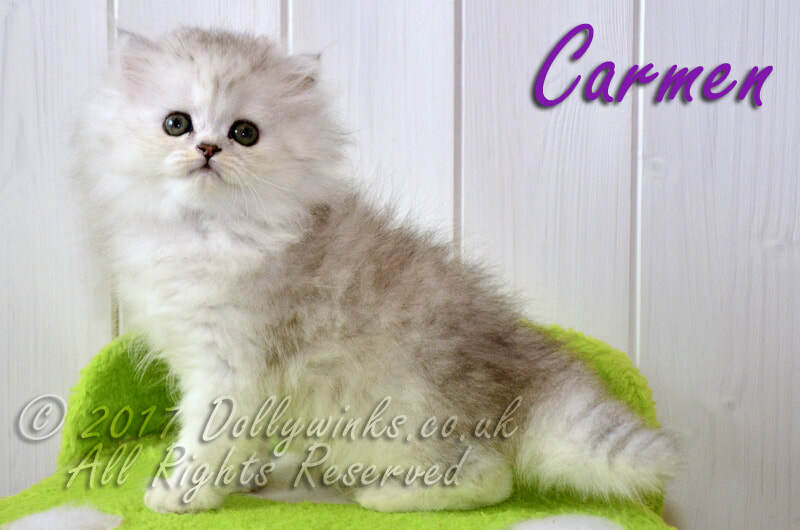 Would suit any family environment and is 'bomb proof'. 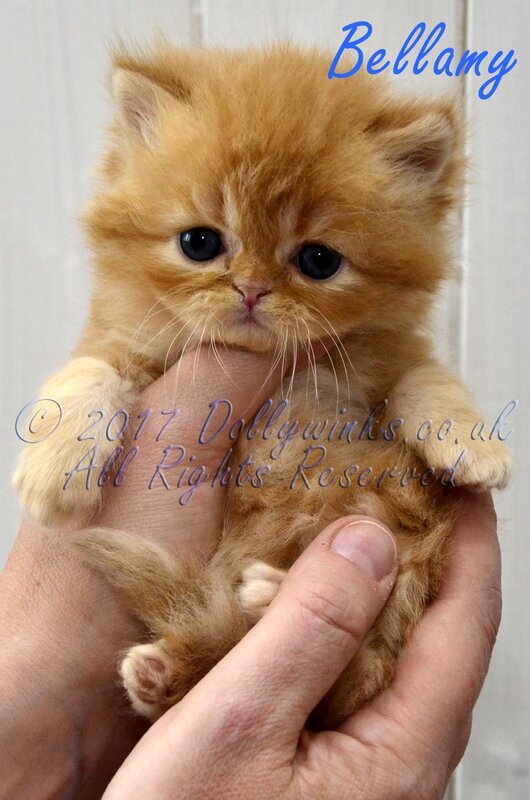 Big on purrs. 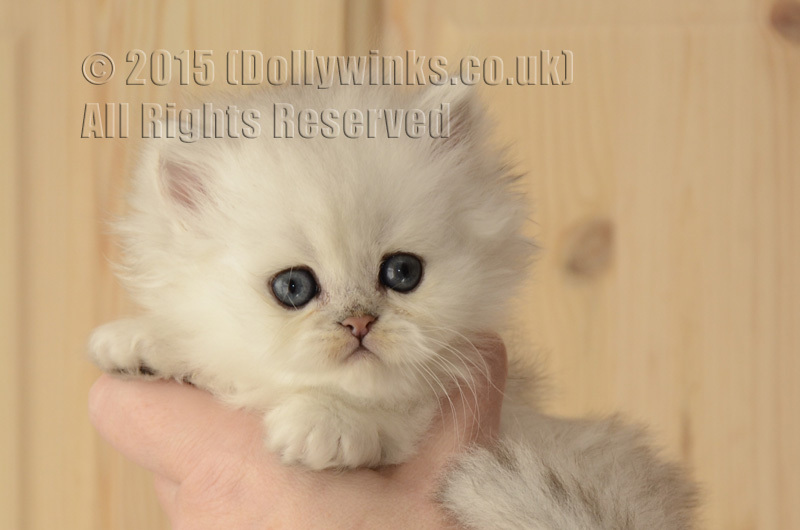 Martha is a blue mitted female ragdoll kitten..Extremely pretty girl would be good to show, as she loves to pose. 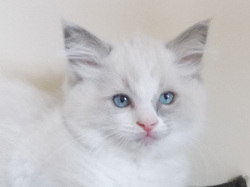 She confident but like to watch everyone else play. Adores her cuddles. 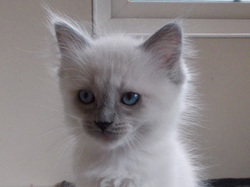 Ina is a blue bi-colour female ragdoll kitten. Possibly available on the active register / for breeding to an established, knowledgeable breeder. Oliver is a blue bi-colour male ragdoll kitten. 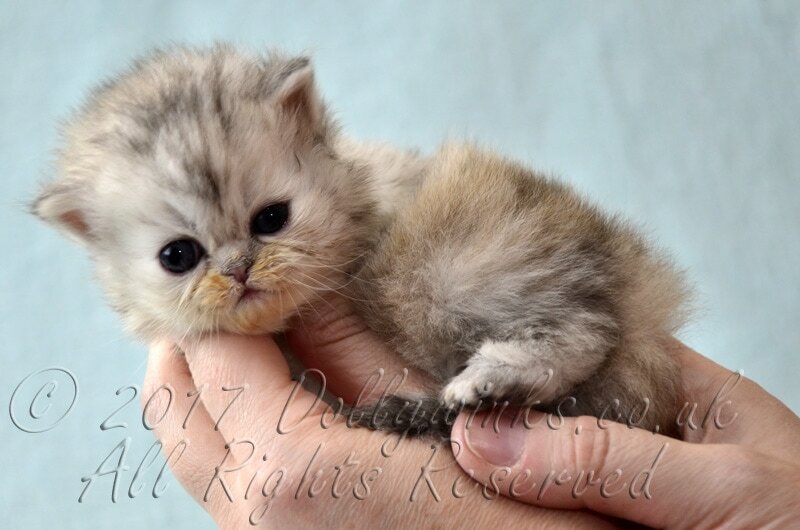 He was the last to be born in this litter of six. He was the smallest born but has more than made up for it with a huge appetite for food. If you want a 'lap cat' then he is the one for you. 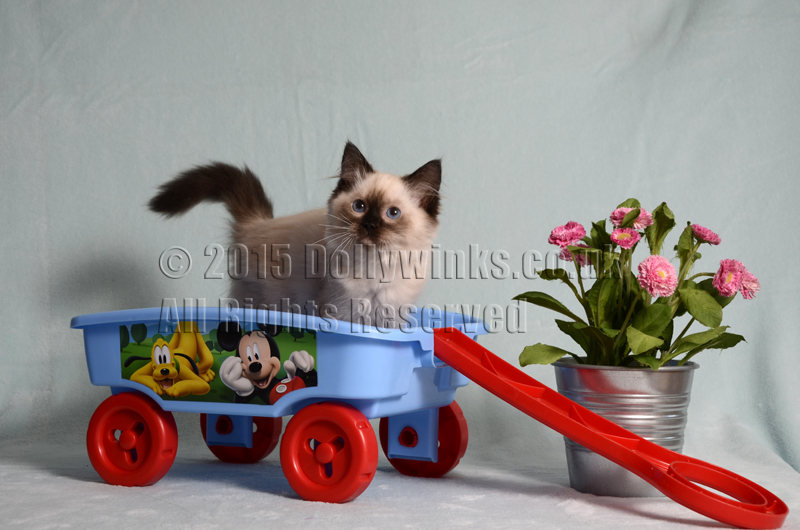 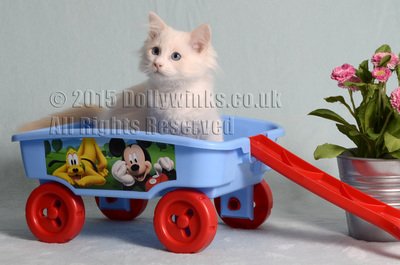 Ramsey is a blue bi-colour male ragdoll kitten. 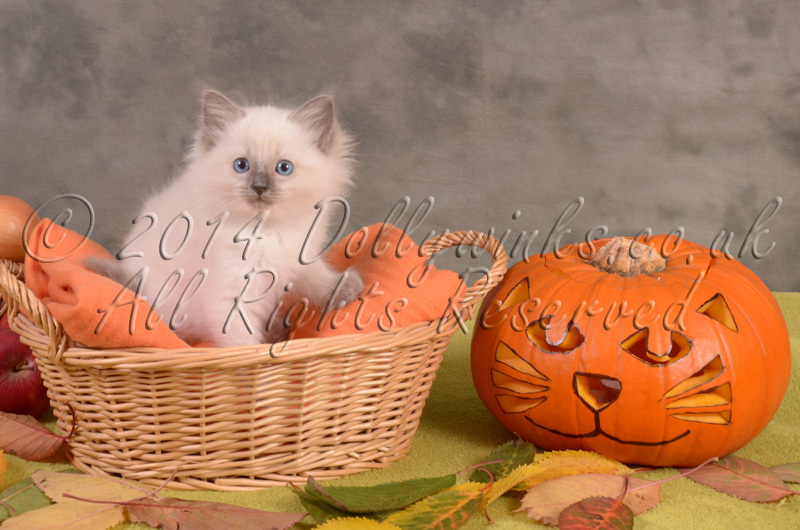 Gino is a blue mitted male ragdoll kitten. 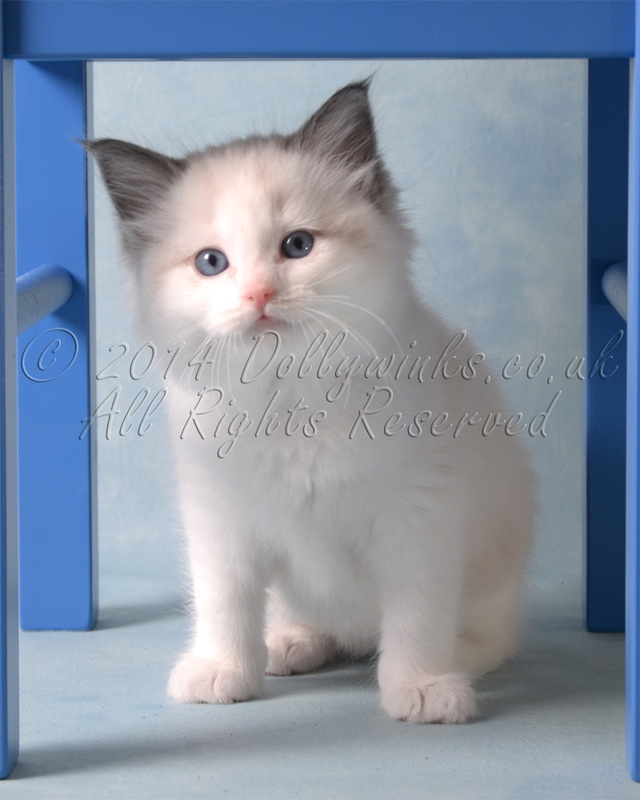 Delia is a blue bi-colour female ragdoll kitten. 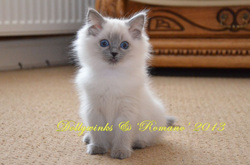 These Ragdoll 1 male, 1 female both blue colour point kittens are from a mating of 'Bliss' (Adecilo Purrfect Bliss) and 'Jenson' (Ladydoll Simeon). Jill blue colour point femal ragdoll kitten. Bold confident female. 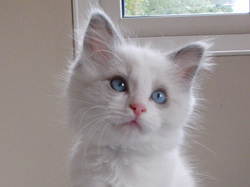 Great Ragdoll type. Would suit any family environment. This little girl is big on purrs and is available now. 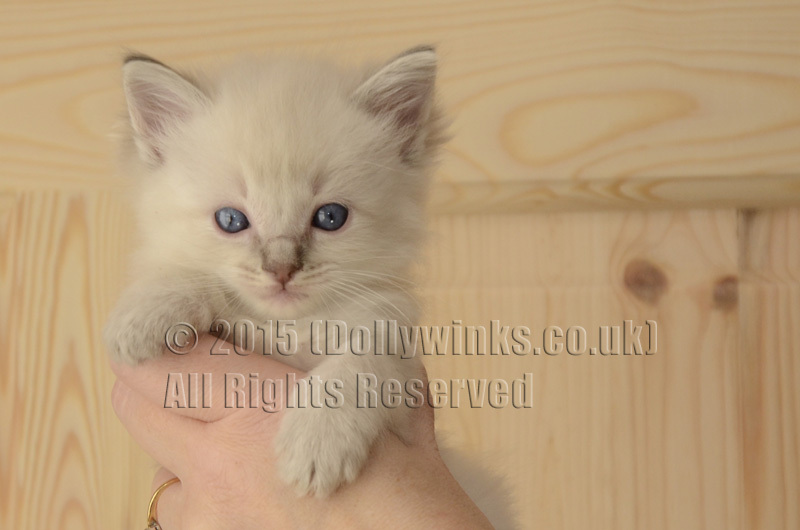 Jack blue mitted male ragdoll kitten.